und primarily my dear Jamuna, as well as her sister Ganga. 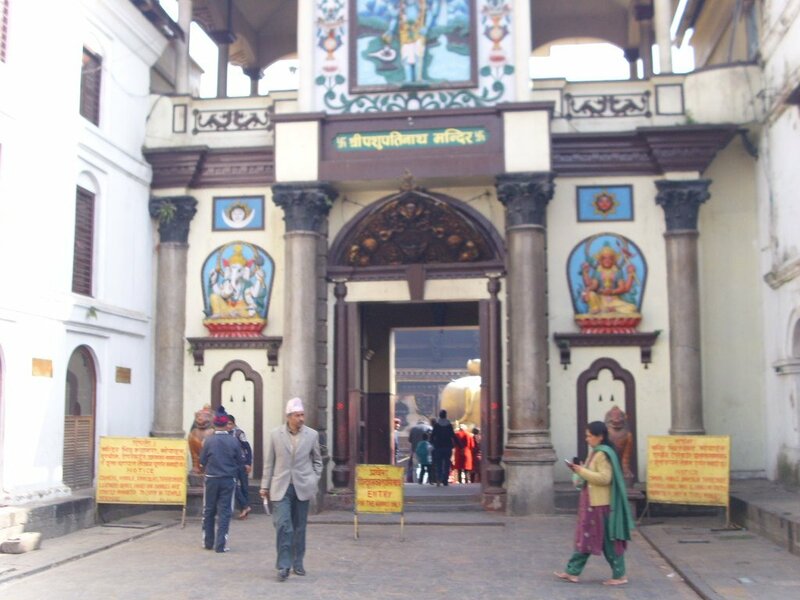 On October 7th 2008, afternoon, I came across a message about the appointment of a three-year old girl as the Royal Kumari of Kathmandu, a living goddess, which is revered as an incarnation of the Hindu goddess Taleju. I started researching and discovered a world that seems to be from another time. We know stories of living gods only from the times of the ancient Greeks and Romans. 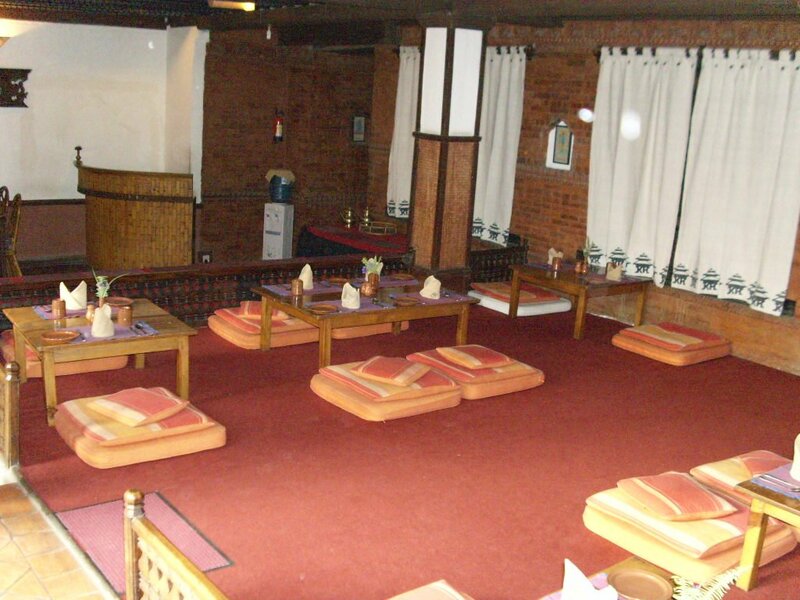 While the years the topic about the Kumaris of Nepal on this website was built from my research and it was clear that once a day I'm going to Nepal myself to see the temples and the culture of this country, which I only knew by the 8000 m peak of the Himalaya till that time and in which I was rather little interested. A concrete plan or even date was still not fixed at this time. I also could not imagine at that time, what will wait for me and that 8 years I would still work on this topic and my plan actually come true. 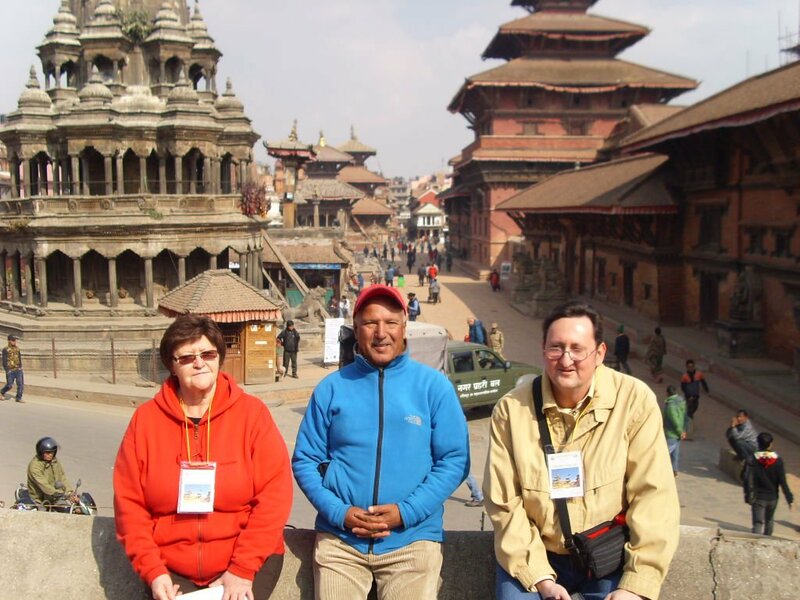 In spring of 2013 I got to know Jamuna and Ganga Bajracharya from Bungamati, a village about 12 km from Kathmandu. Meanwhile I have a regular contact with Jamuna and also with Ganga. 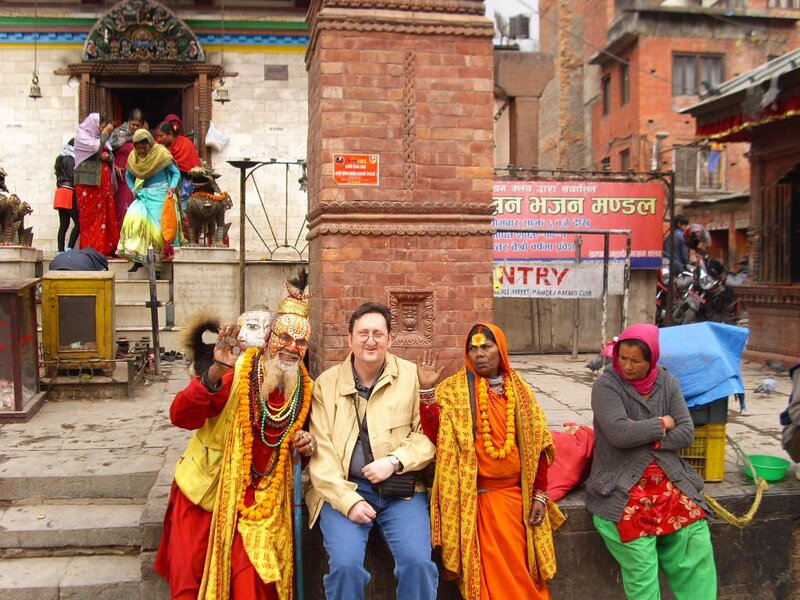 So now it's clear, I have to go to Nepal. At the beginning my parents were not enthusiastic about the idea of traveling so far to one of the world's poorest countries, and it took a lot of persuasion. When I finally began with first plans for the trip and had taken an appointment in October 2014, a serious illness of my mother nullified my plans. So I began to plan for October 2015, but once again scheduling difficulties was indicated. 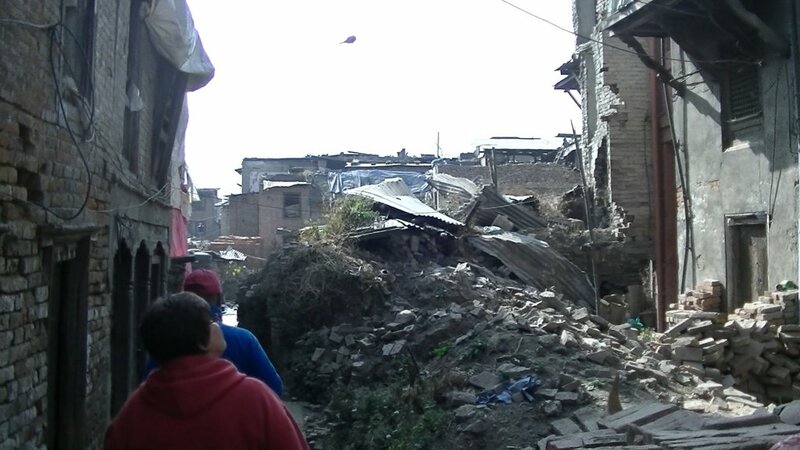 Then on 25 April 2015, a severe earthquake hit Nepal, and again my appointment was no longer possible to realize. So for the third time a new plan. This time it should be January 2016. 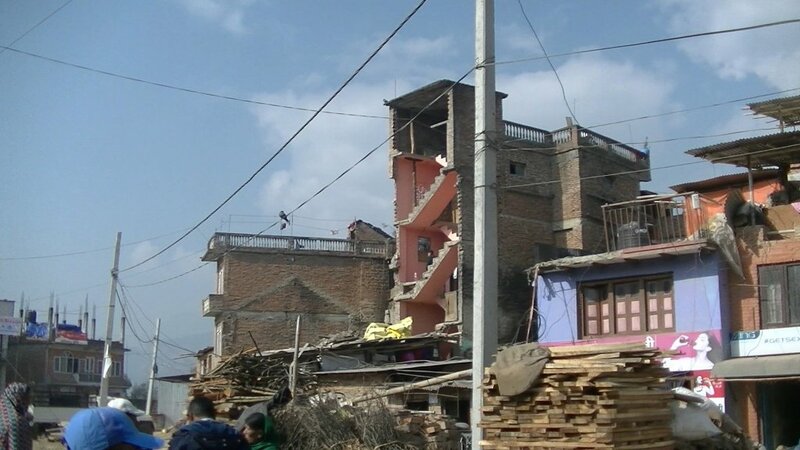 Especially my mother had fear to fly to Nepal already 8 months after the earthquake, but I didn't want to postpone the journey again. Because I have read repeatedly on the Internet of difficulties with customs for electronics at arrival and departure, I requested certificates for my computer and photo stuff at the local customs office. But indeed no one wanted to have or look on the documents. 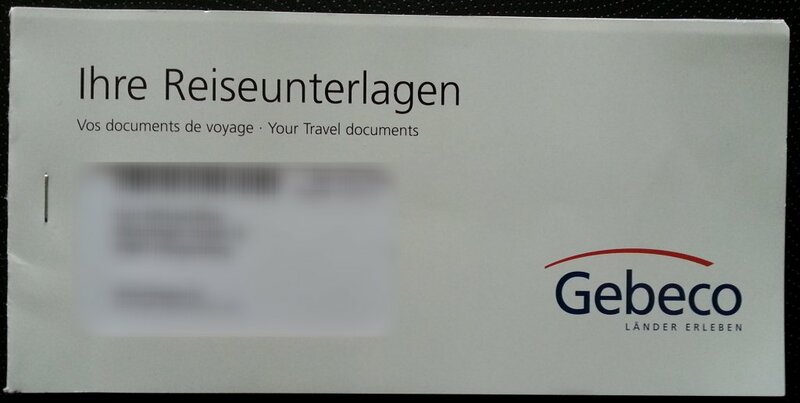 On 24th December 2015, I got the travel documents and passports with the visas by mail. 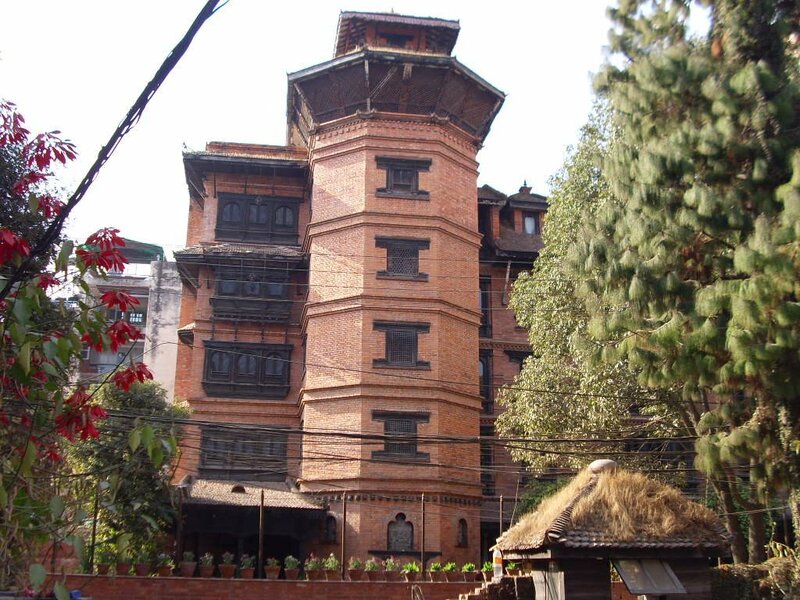 But the anticipation has gone fast, when I saw that on my visa the stamp of the Nepalese Embassy was missing. 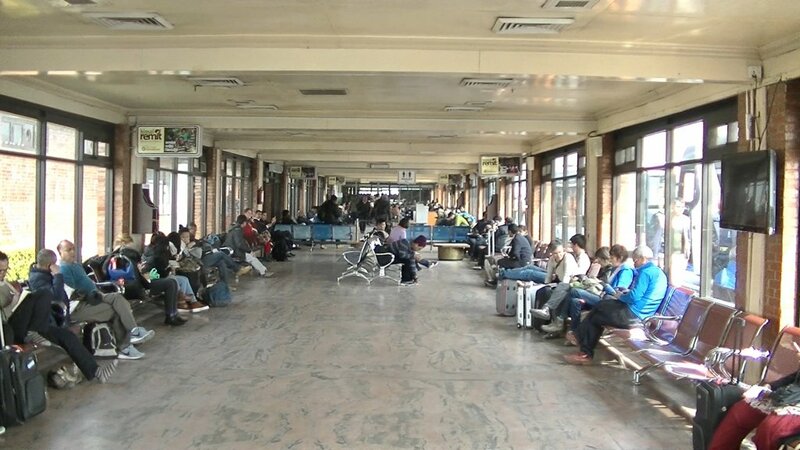 But the Gebeco staff could solve the issue in time, so that it was no problem to do the trip. The check-in was done quite quickly, only a few minutes of waiting time and I had the bording passes for my parents and me. After we finished our water bottles, we went for Pasport and security check. My parents came through the check very fast, but I didn't have that much luck and had to unpack my whole computer and photo stuff. All, including me was tested for explosives. After the check I had to pack all the stuff again. 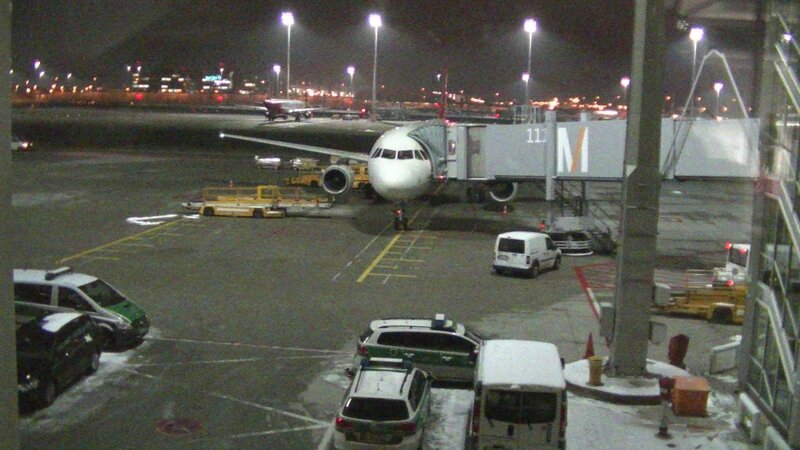 We continued to the gate C1, where already an Airbus A321 was waiting. 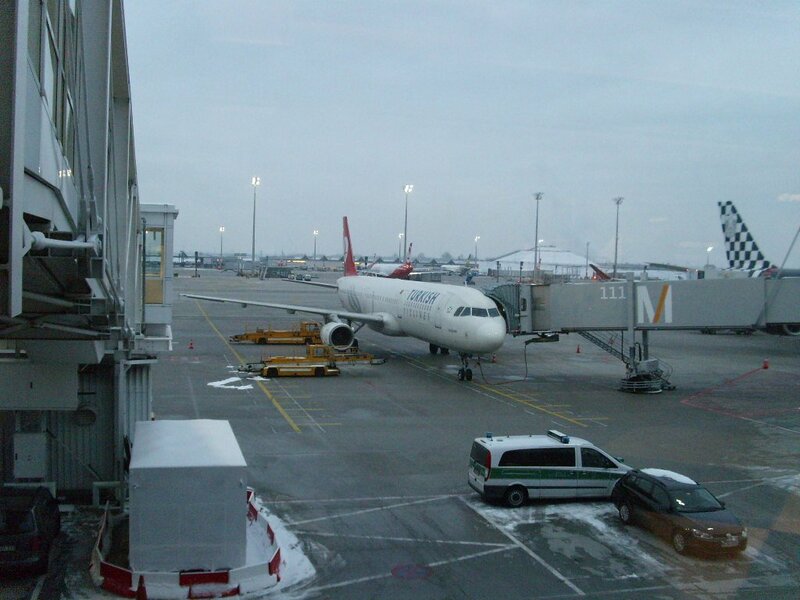 At about 18:15 boarding began and after a small tour around the airport to the de-icing system, we were starting the flight to Istanbul. On the flight from Munich to Istanbul we had dinner. 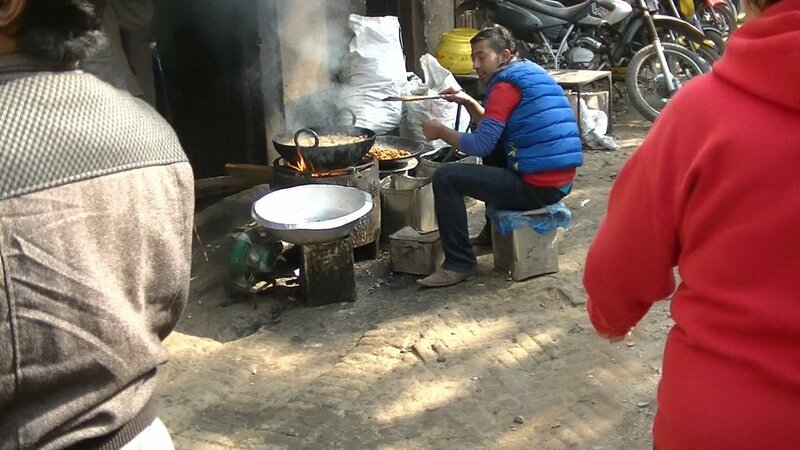 There was chicken with rice and vegetables, which tasted really good. Unfortunately, I made the mistake to pack my camera in the trolley into the overhead compartment. While approach for landing nice night shots would have been possible. After the landing we had a longer tour around the airport, I think it was a minimum of 20 minutes till we arrived at parking position. 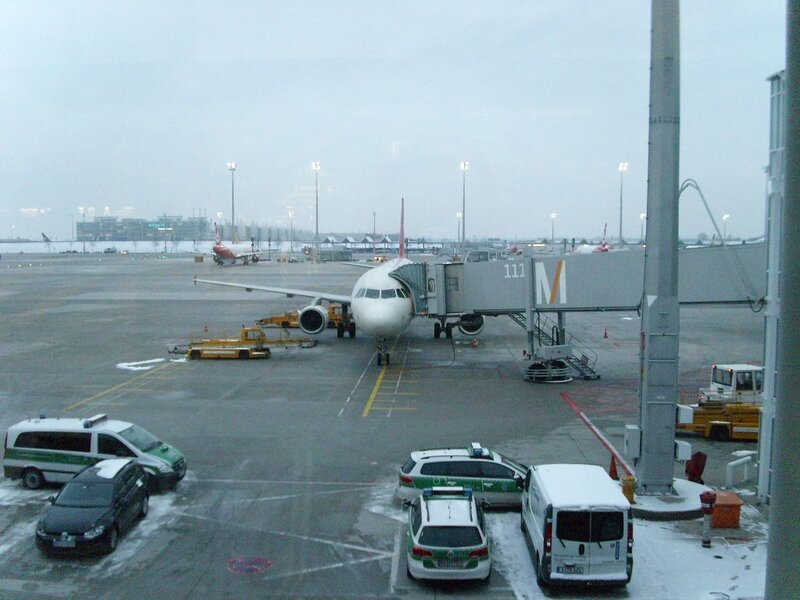 The change was quite quickly and we needed only one time to ask to find the departure gate. 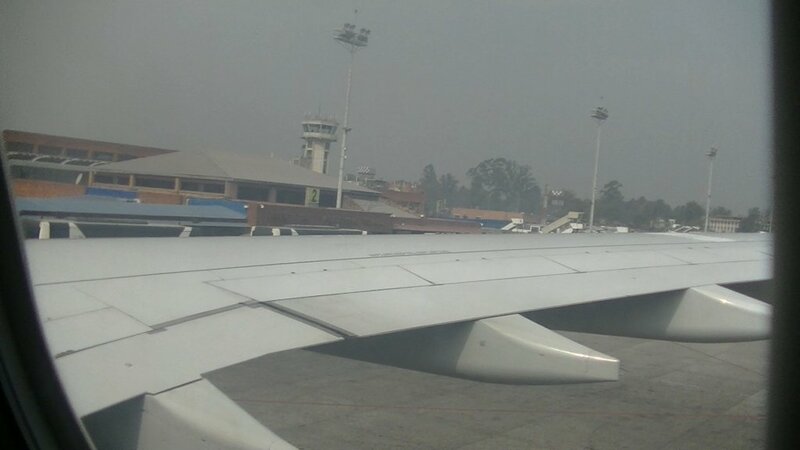 From gate 212 we continued by an Airbus A332 to Kathmandu. But first we again had to wait for boardinng. 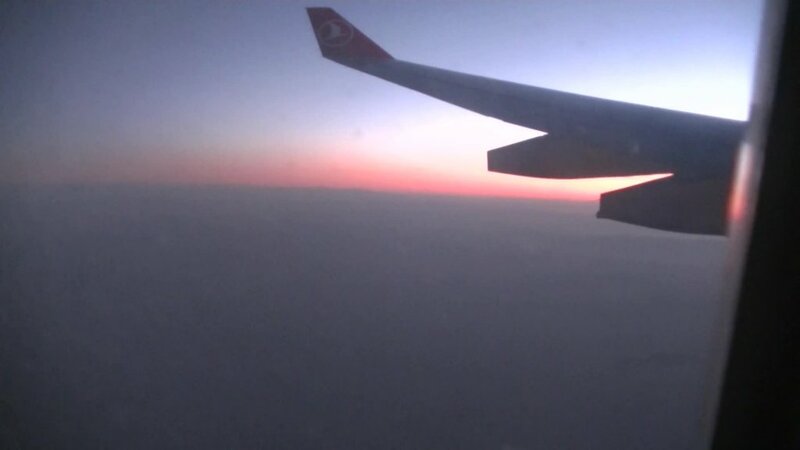 On the flight from Istanbul to Kathmandu nothing special was to see, except the sunrise. Becuase of many clouds it was not possible to see the 8000 m peak of the Himalayas. Before and during the approach for landing, there was some turbulence. We had to wait some time at the baggage carousel till we could get our luggage. 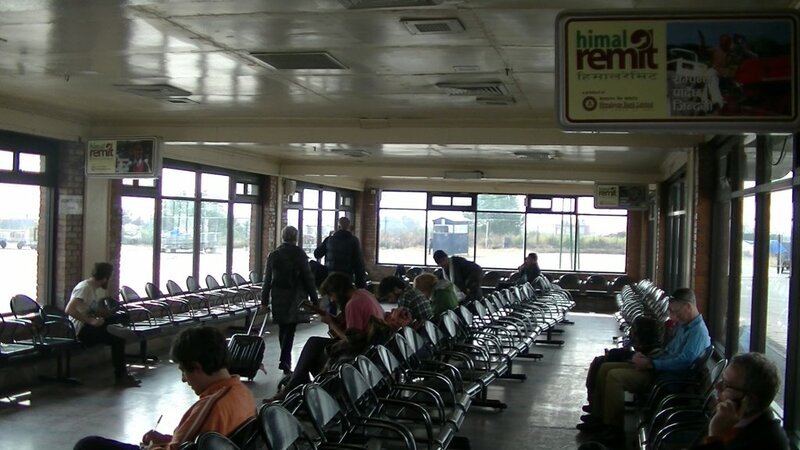 It's interesting, what travelers take to Nepal ... :-) After we finally got our luggage, we went through the exit security control. This security control is actually a joke. At everyone the system has beeped and lit up in red, but the guard didn't notice that. He was much more busy with pulling of the luggage stickers from the boarding passes and comparing them with the luggage that you brought. Ok, so at least no one can leave the airport with the wrong luggage. 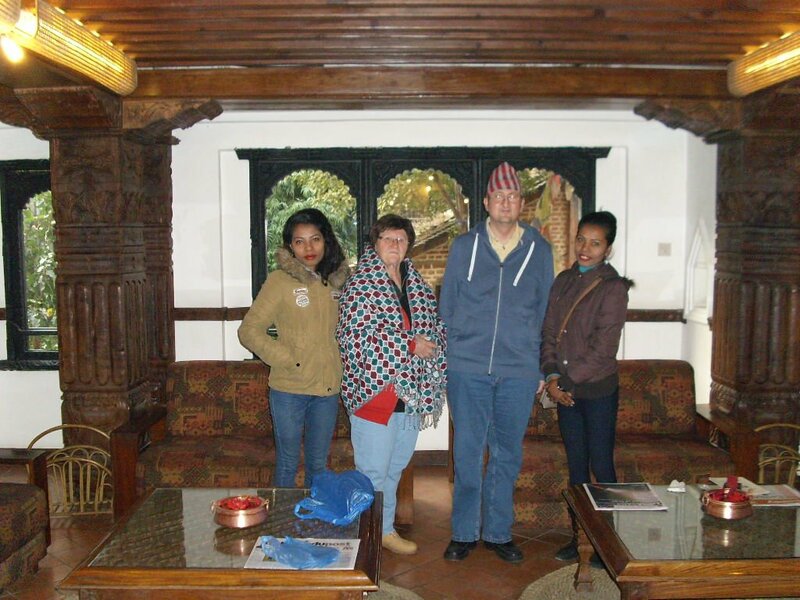 After arrival at hotel ( Kantipur Temple House ) we were welcome with a coffee and we got shown the hotel. Meanwhile our luggage was brought to our rooms. Meanwhile we were en route for more than 24 hours and after we were unpacking, under impressions of the trip from airport to the hotel, my mother said: "I'll not set a foot outside here!" :-) So she reclined to relax for some time. 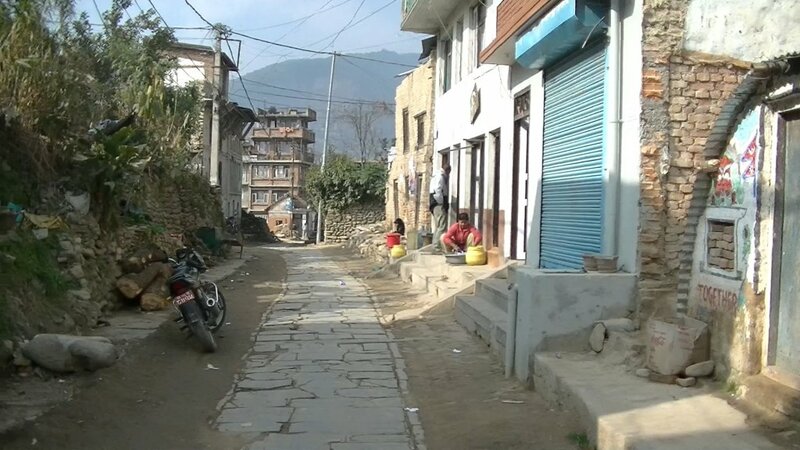 Meanwhile my father and me went to Thamel to buy some bottles of water. There was supplied water at the hotel, but no acidulated water. First my parents were skeptical to drink the water, but finally they drank, because it was also supplied for breakfast and dinner. Actually, the first meeting with Jamuna and Ganga was already scheduled for tonight, but Jamuna said, we better should have a rest after the long journey. What a pity! I was looking forward so much to see Jamuna and Ganga at arrival day. After dinner we went to bed early to be fit for the next day. Another reason was, that it's getting bloody cold as soon as the sun goes down. 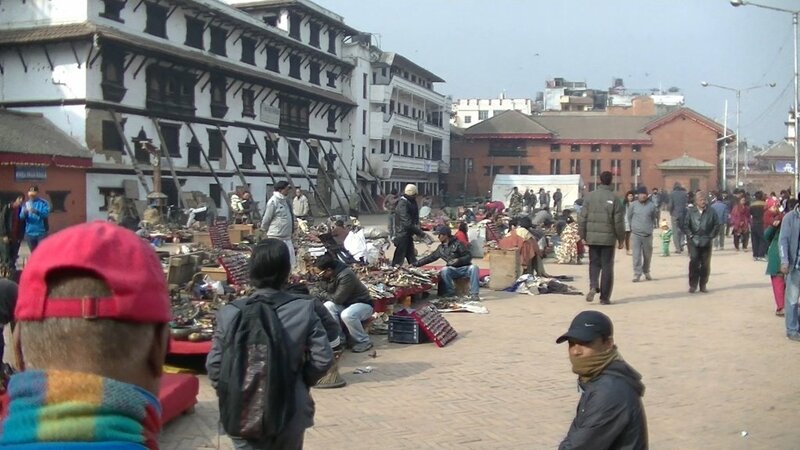 While the day in January it's about 15 - 20 �C at Kathmandu, but after sunset it's getting quickly partial less than 0 �C. Mostly there is no heating at the houses and hotels. 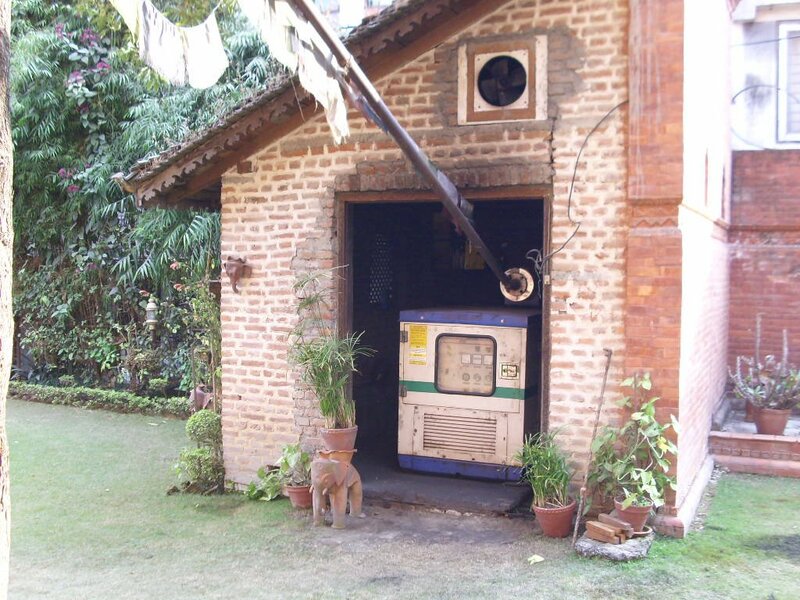 The small electric heaters, we had in our rooms, only were working while there was electricity. 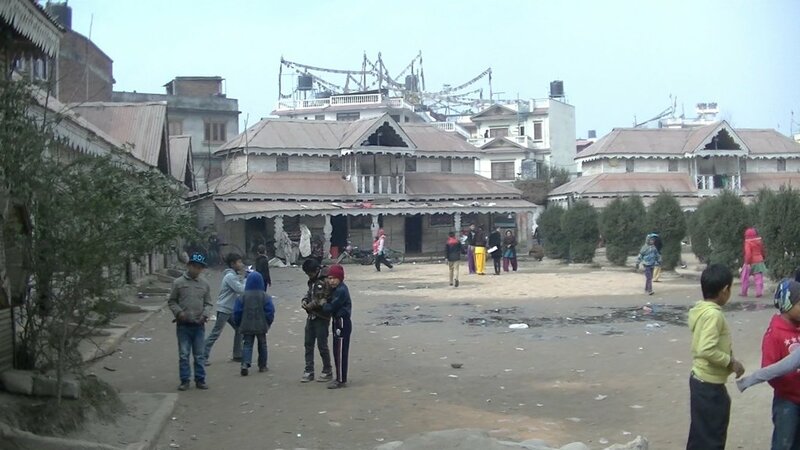 The bad thing is, that electricity is rare in winter in Nepal too, because the so called "Load shedding" is on mavimum in winter in Nepal. Electrical generation and transmission systems may not always meet peak demand requirements- the greatest amount of electricity required by all utility customers within a given region. 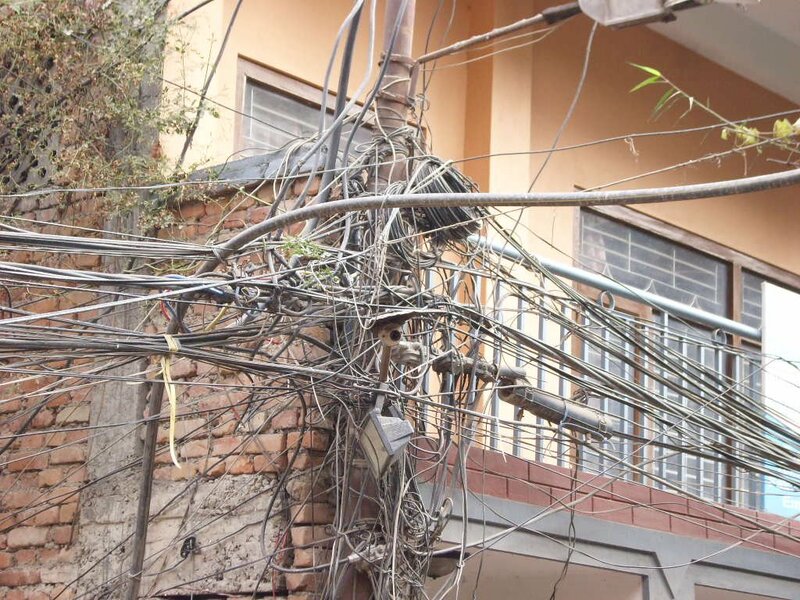 In these situations, overall demand must be lowered, either by turning off service to some devices or cutting back the supply voltage (brownouts), in order to prevent uncontrolled service disruptions such as power outages (widespread blackouts) or equipment damage. Utilities may impose load shedding on service areas via rolling blackouts or by agreements with specific high-use industrial consumers to turn off equipment at times of system-wide peak demand. 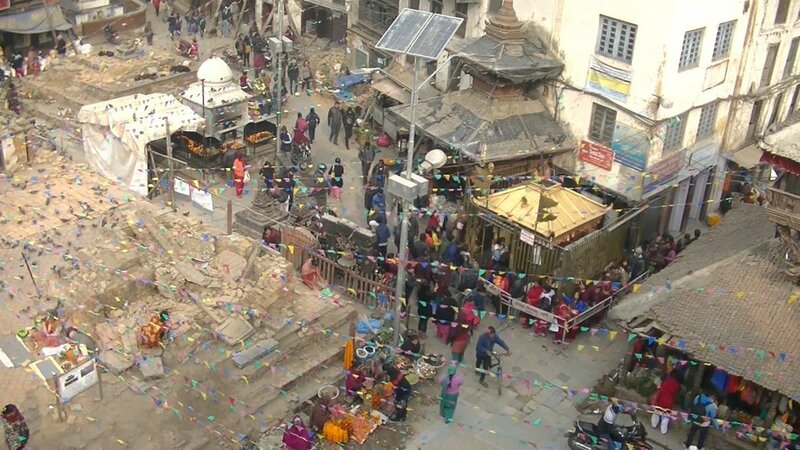 In Nepal load shedding is realized in that way, that the Kathmandy Velley and the whole country is seperated in seven groups, in wich daily electricity is shut down while different times. In winter the duration of the shutdowns can be up to 16 hours per day. While our stay the daily shutdowns were at about 13 hours. 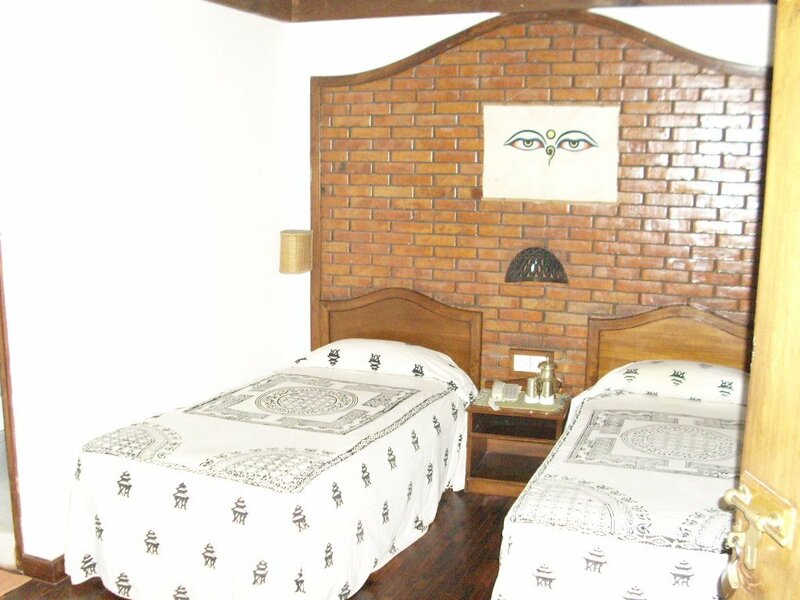 Our hotel is in group 1 and Bungamati, where Jamuna and Ganga are from, is in group 2. After our first night in Nepal, we went for breakfast at 8:15. Actually there would have been a breakfast buffet at the hotel, but because of only a few guests after the earthquake and due to the fuel crisis, they didn't make it. But you could order every thing, you wanted for breakfast. 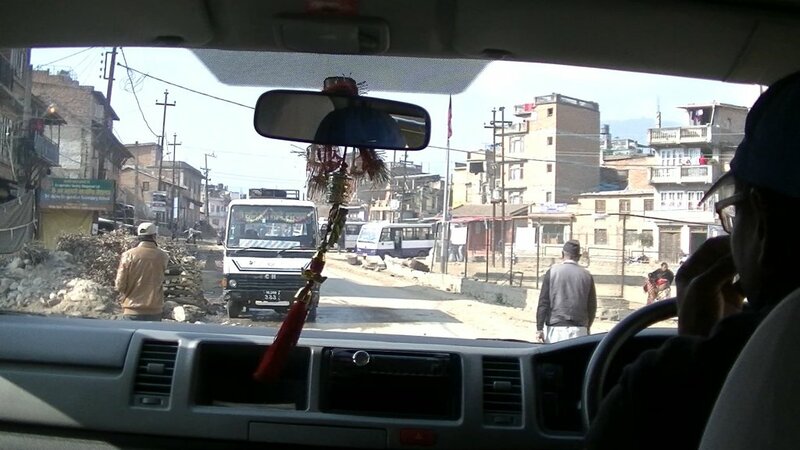 At 9:30 we met with our guide Ram and our driver, also named Ram, and we started our trip from hotel to Swayambhunath. 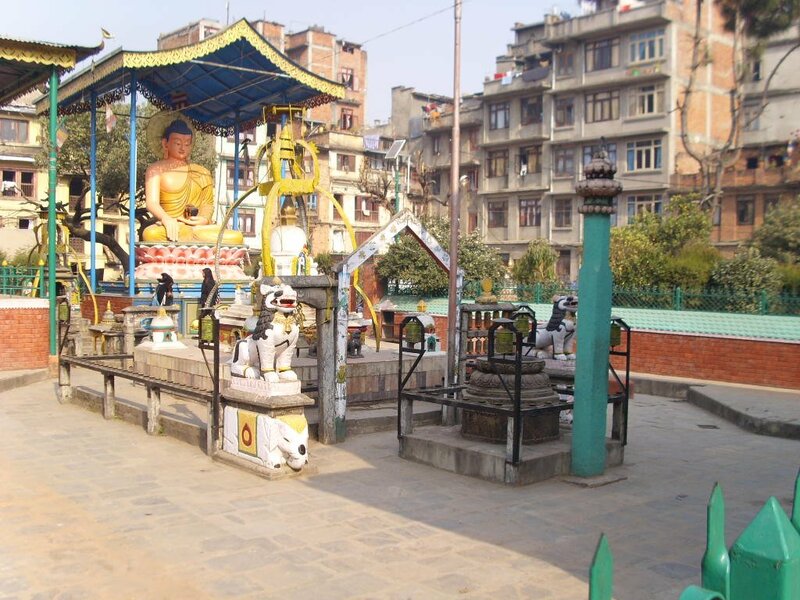 The first stop we made at Buddha Park with its three large Buddha statues. 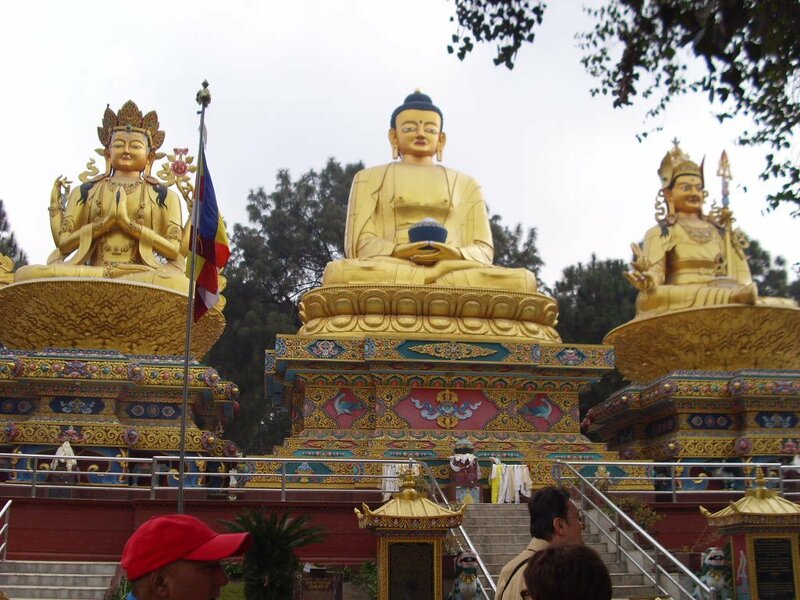 In the middle of the three statues is the 20.4 metre high and so the largest Buddha statue in Nepal. 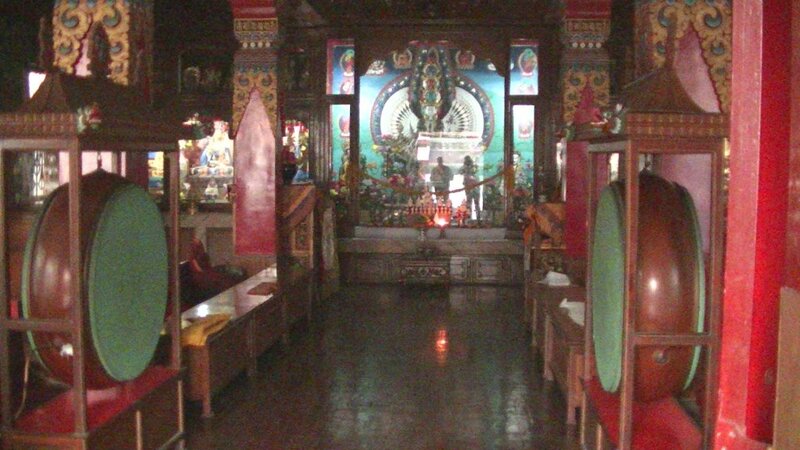 It shows the Buddha Amitabha, the Buddha of immeasurable light shine. 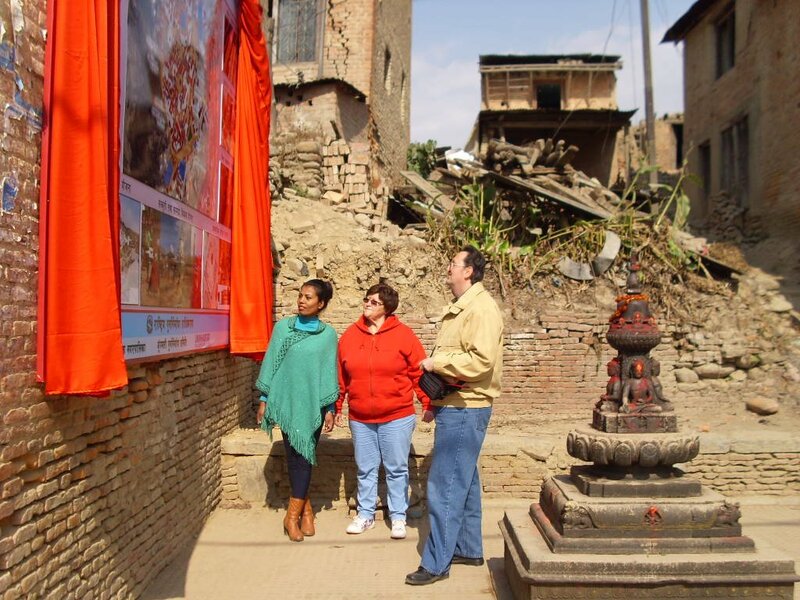 On left side is located the 19.5 meter high statue of Avalokiteshvara, the bodhisattva of universal compassion. 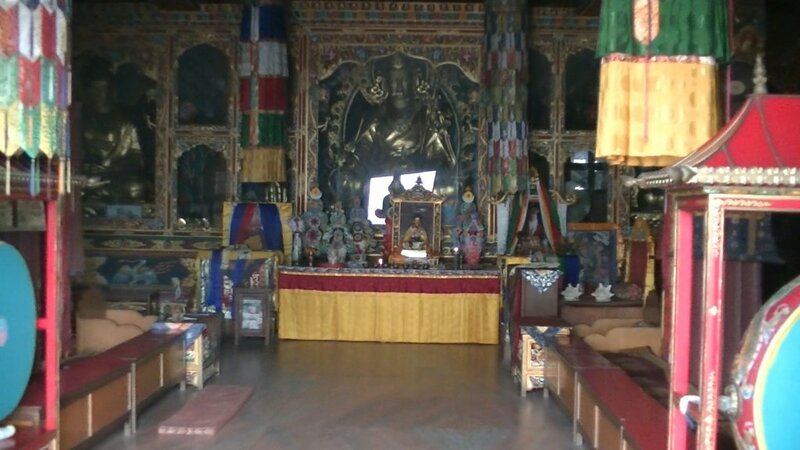 And on the right side is located the 19.5 meter high statue of Padmasambhava or also called Guru Rinpoche, who is regarded as the founder of Buddhism in Tibet. 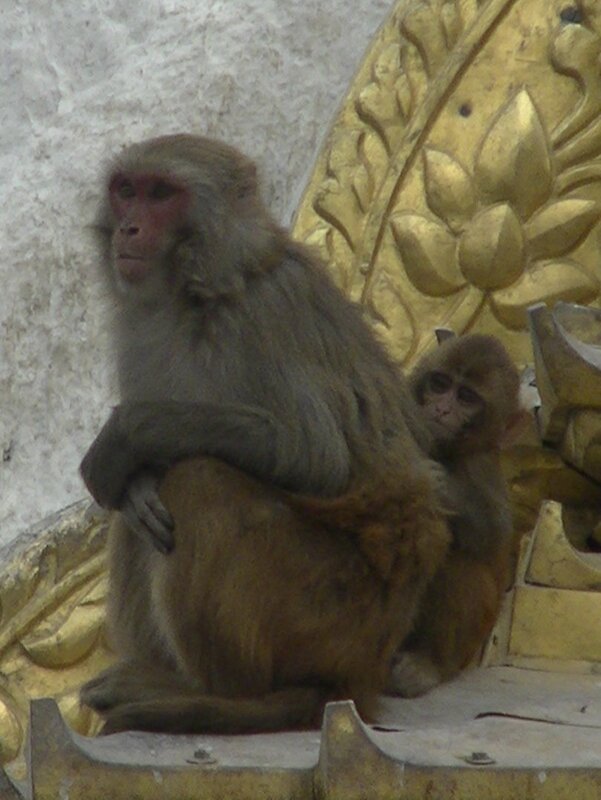 We continued up to the stupa of Swayambhunath, or also called "Temple of the monkeys", because of the many rhesus monkeys living here. 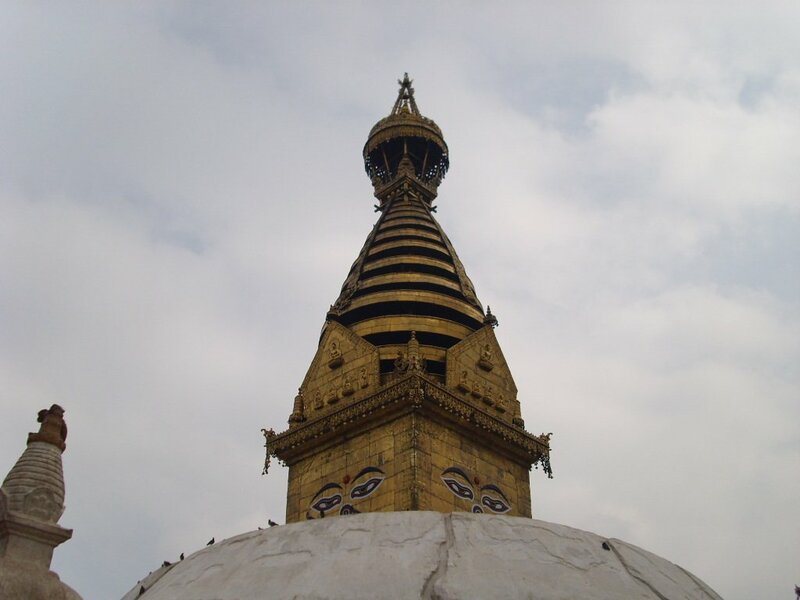 Swayambhunath is a temple complex, whose main building is the great Buddhist Stupa, which is flanked by two Hindu towers. 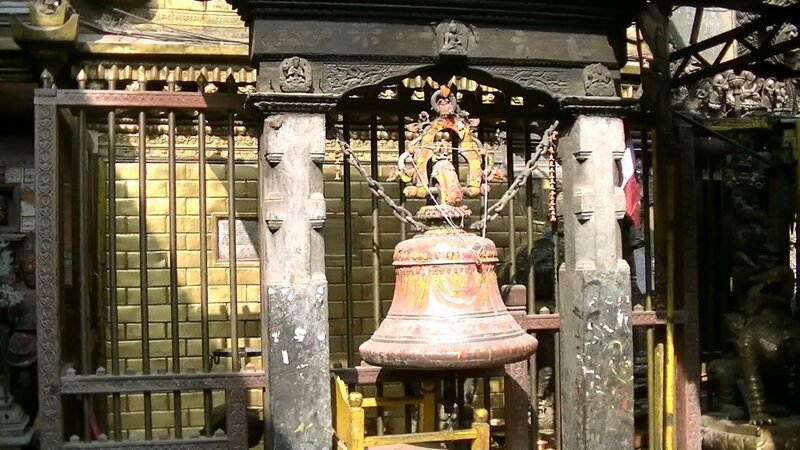 The temple complex of Swayambhunath is one of the oldest Buddhist temple complexes in the world and is estimated to be approximately 2500 years old. 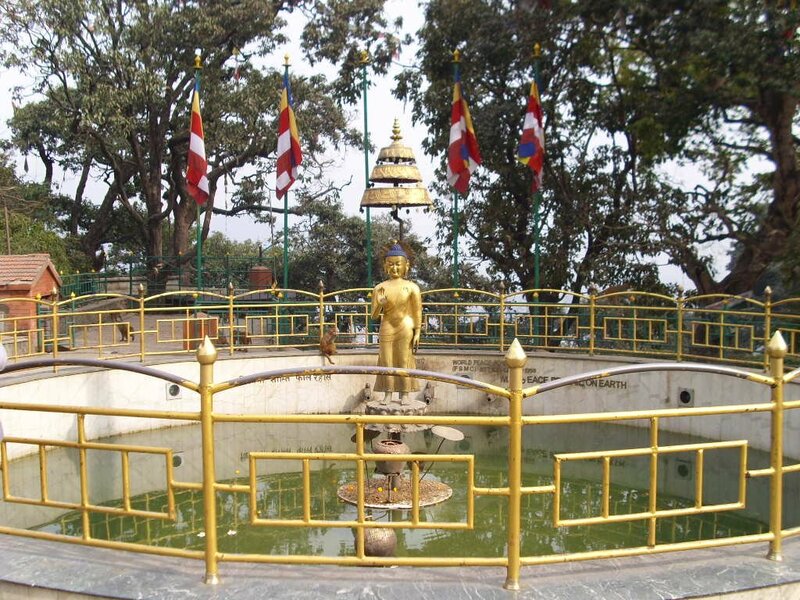 Formerly the Kathmandu Valley was a lake. One day Sadhus discovered a Lotus Bloom in the middle of the lake and for centuries pilgrimage came to the banks of the lake to worship the Lotus Flower, revered as a symbol of God. 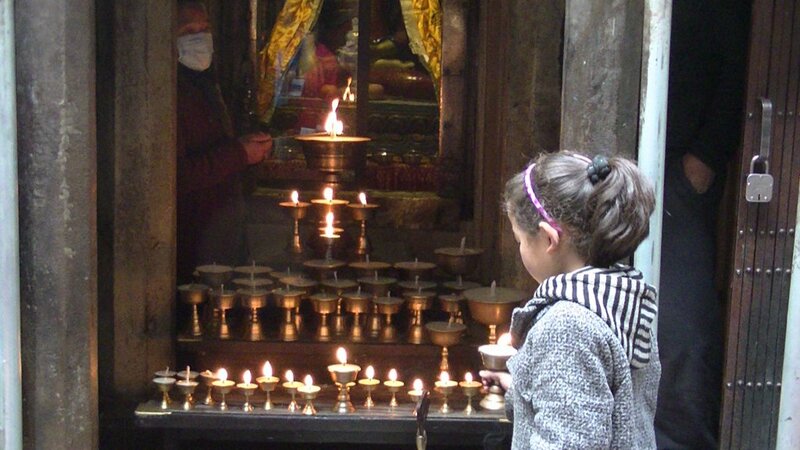 One day a bright flame arose from the Lotus Cup and Swayambhunath created itself - the God is even created. The manifestation of Buddha shone until the bodhisattva Manjushri from China visited the Lake. After a tree-time tour around the lake, with his sword he cut a gorge into the southern hills. The flame disappeared with the outflow of water. 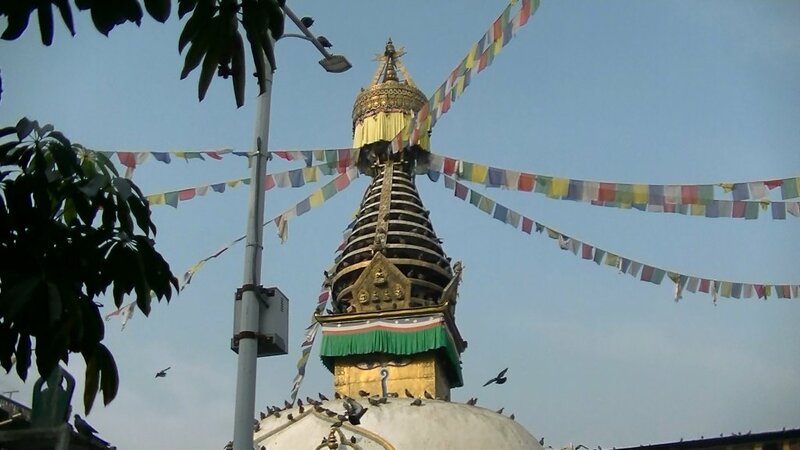 He planted the blue shining Lotus on the Hill of Swayambhunath. 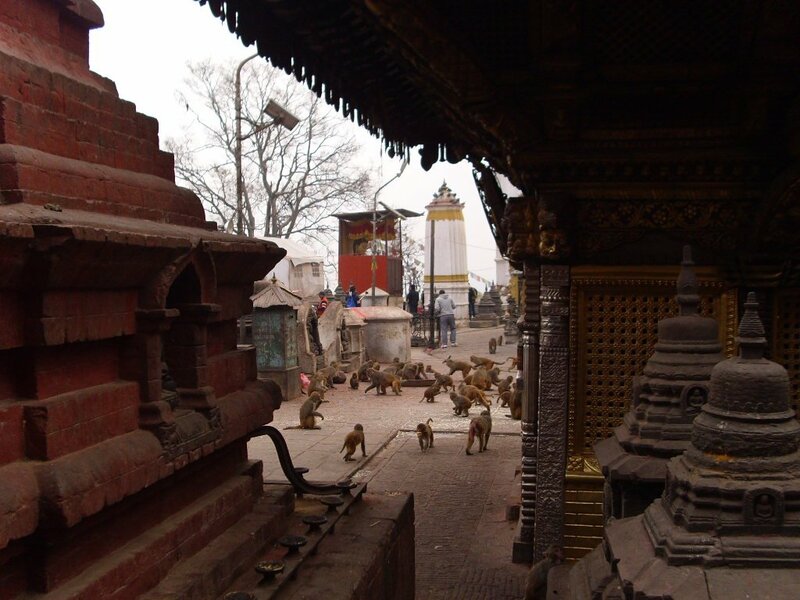 Monkeys at the "Temple of Monkeys"
After a walk through the Swayambhunath complex, we drove down to the old town of Kathmandu. Nearby the Durbar square we left vehicle and from there we had a walk through the old town to the Durbar square and continued back to our hotel. 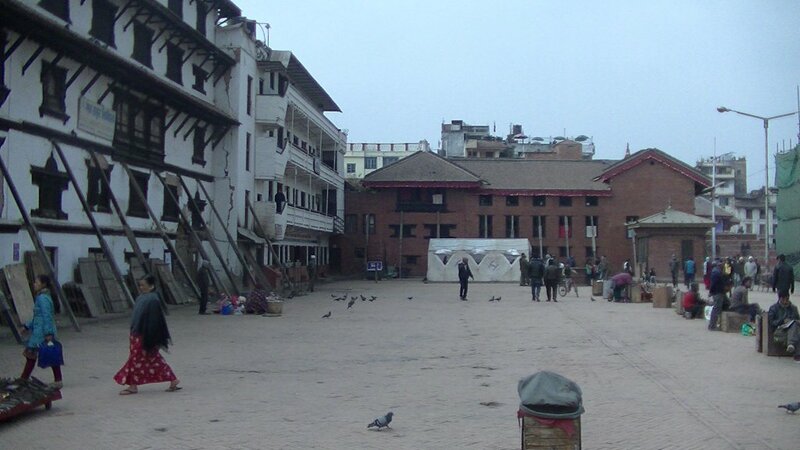 At the southern end of Durbar Square is the "Freak Street". It actually is named Jhochhen Tole. 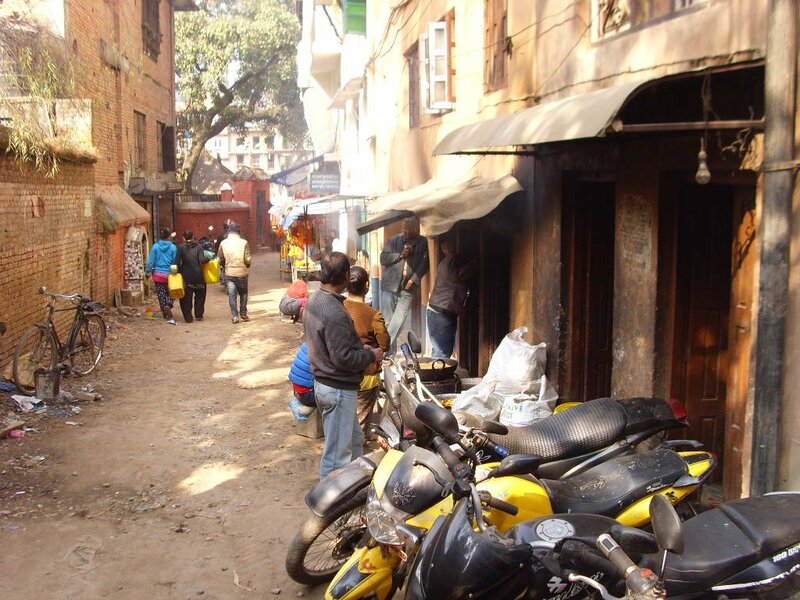 The name "Freak Street" was given in the 60s and 70s of 20th century, in the time of the "hippie trail". The "hippie trail" describes a travel route overland from Europe to South Asia. 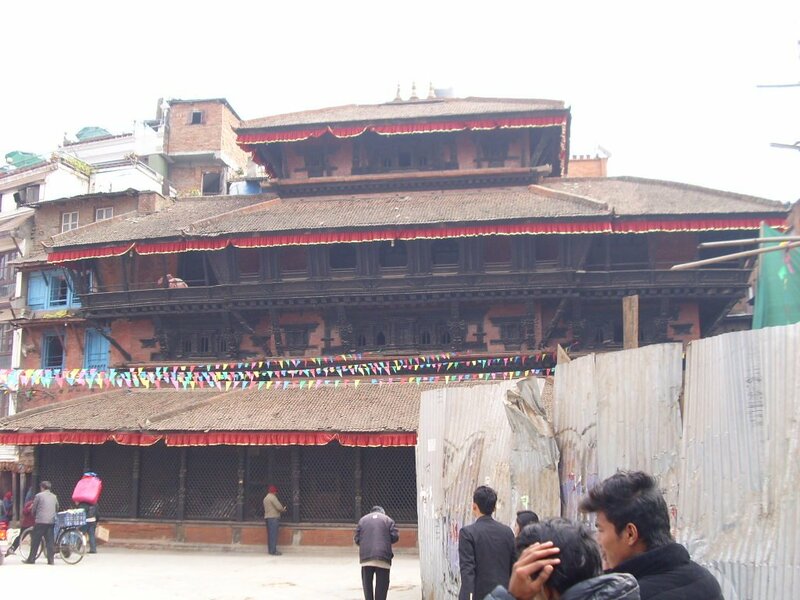 The Hanuman Dhoka is a complex of approximately 20,000 square meters, which includes the Royal palaces of the Malla Kings and the Shah dynasty. 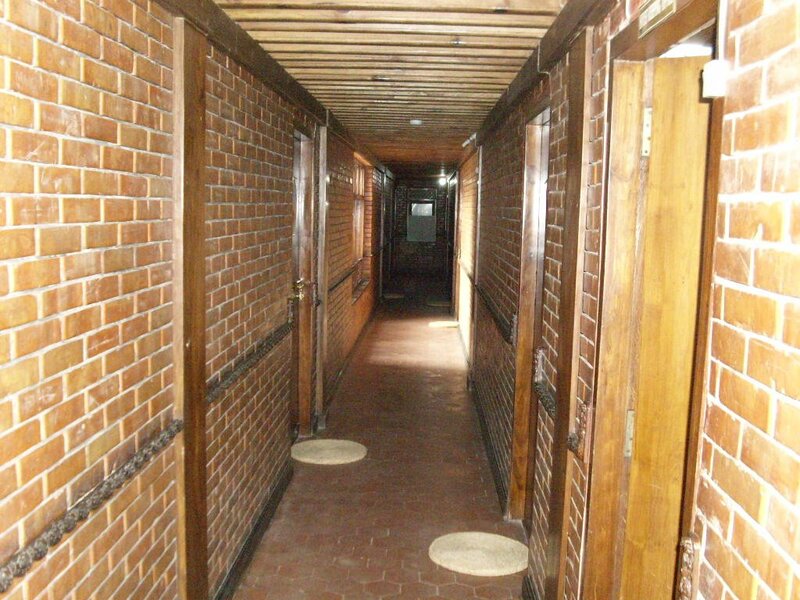 The oldest buildings date back to the 16th century. 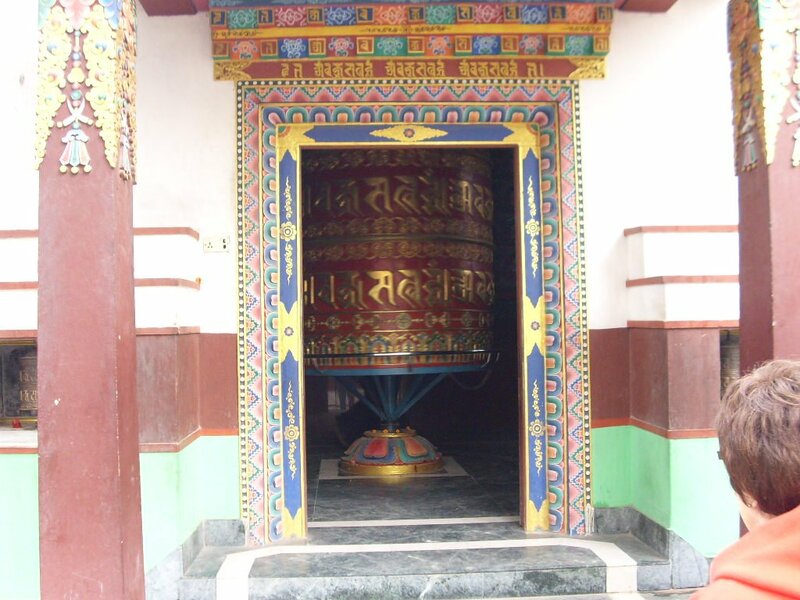 In the 17th century, it was expanded by many temples by King Pratap Malla. 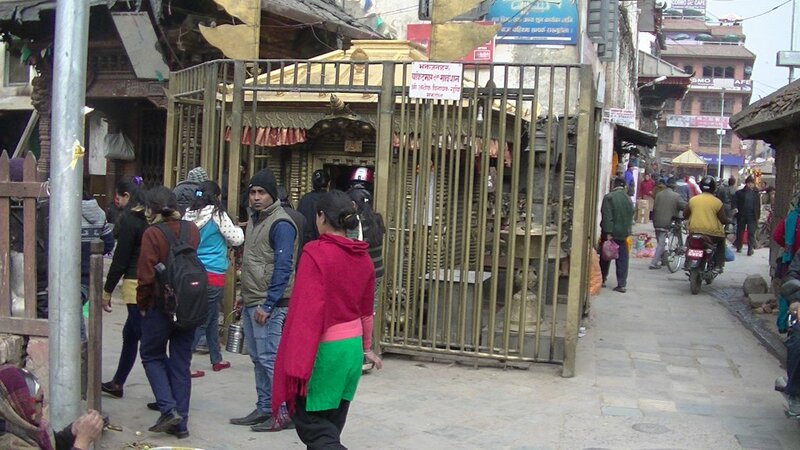 In the East of Durbar Square is the Hanuman Gate, the entrance of the palace, which is guarded by a statue of the Monkey God Hanuman, built in 1672. 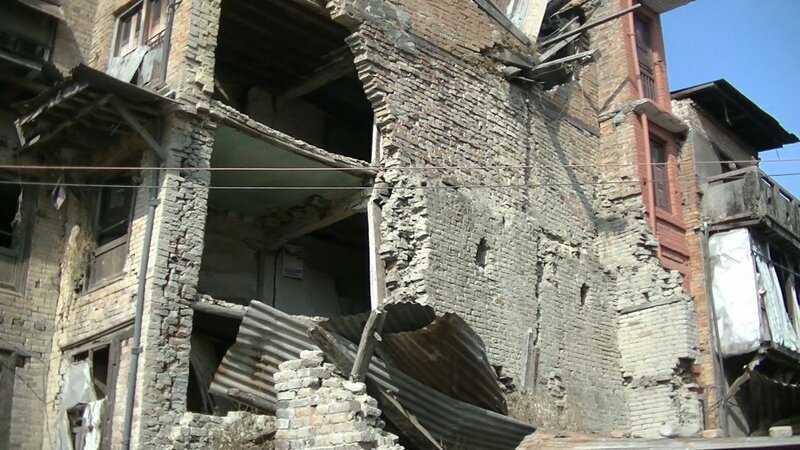 The entire building complex, which today houses a Museum, was badly damaged while the earthquakes on 25th April and 12th May 2015. 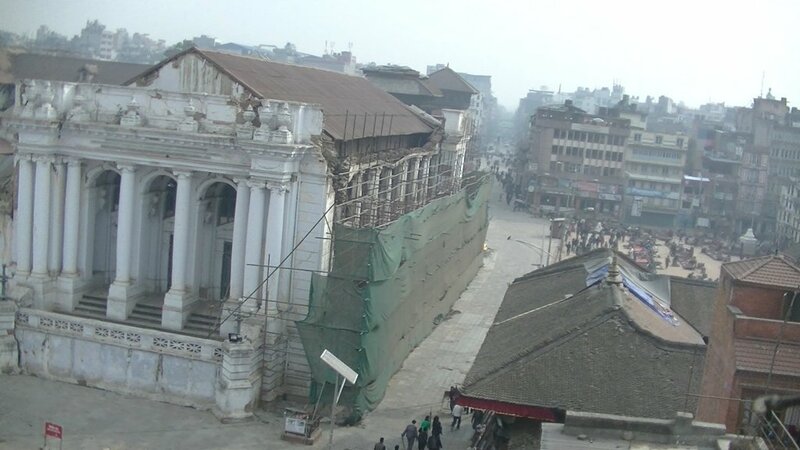 Before the devastating earthquakes of 25th April ans 12th May 2015 there were about 50 temples at the Durbar Square of Kathmandu. 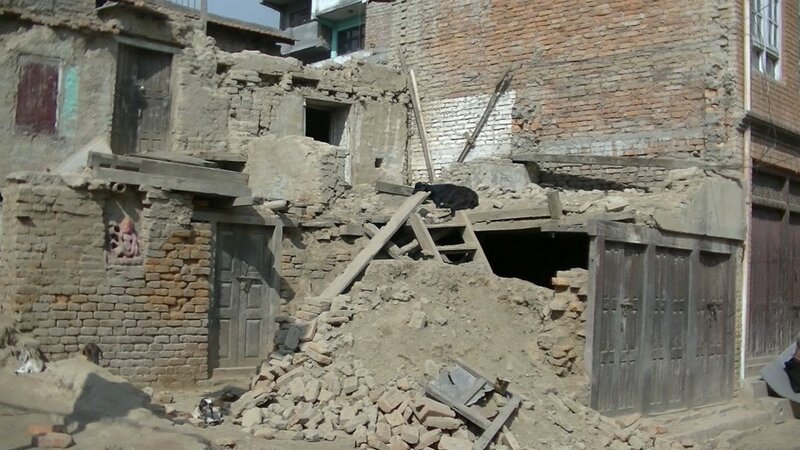 Many of them were badly damaged or destroyed by the quake with a magnitude of 7,9. 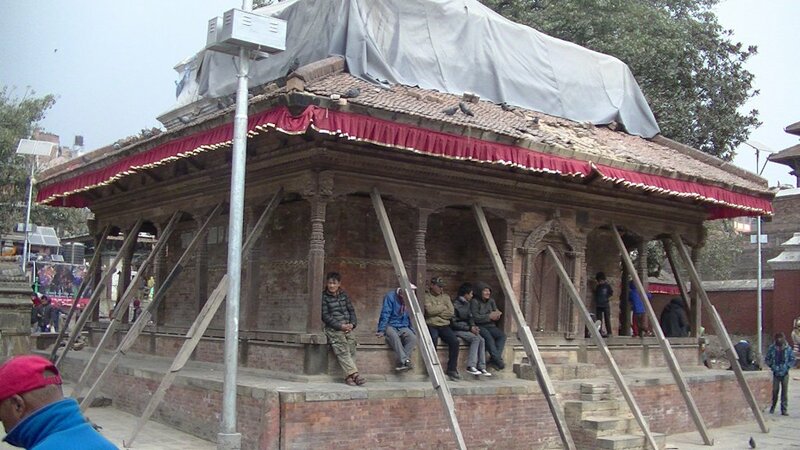 One of the destroyed temples is the Kasthamandap Temple, which is considered one of the oldest buildings in the Kathmandu Valley. 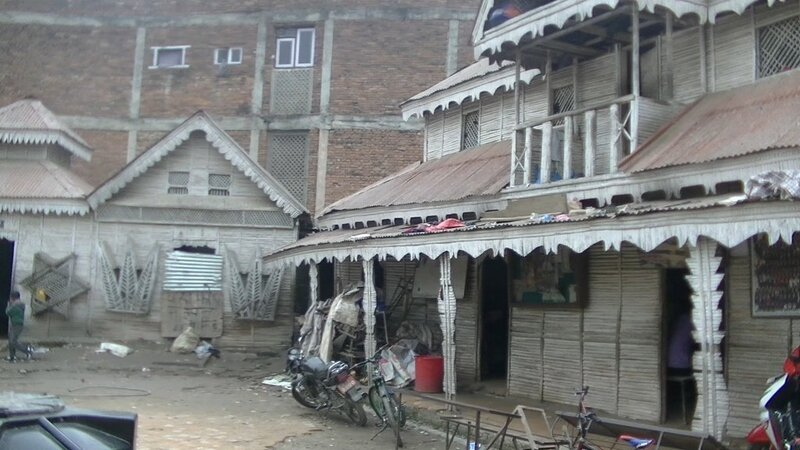 Kasthamandap means something like "wooden house". 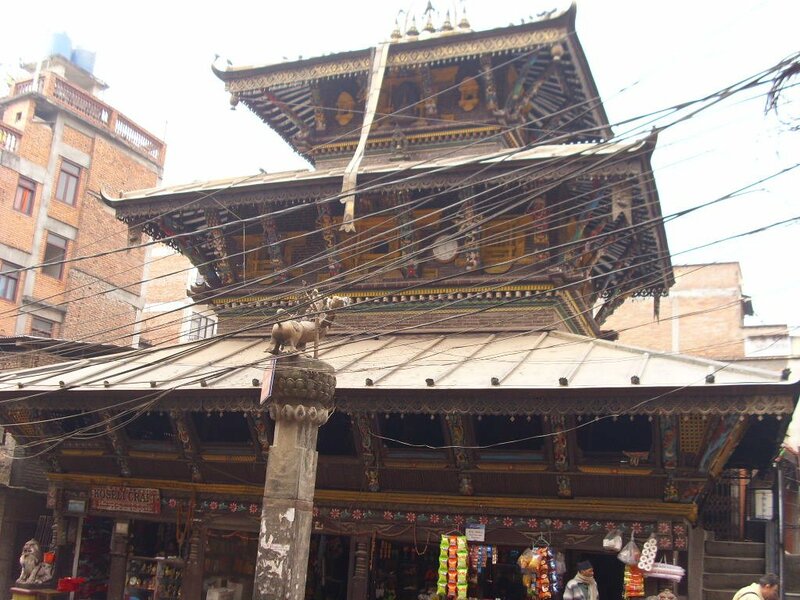 It is believed that the temple, which was originally only a meeting place, was giving the name for the city of Kathmandu. 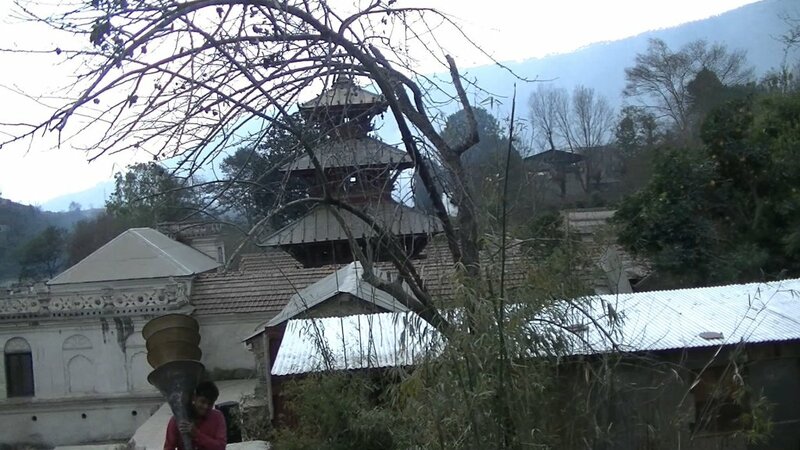 Another well known temple is the Shiva-Parvati Temple, also called Asta Yogini. 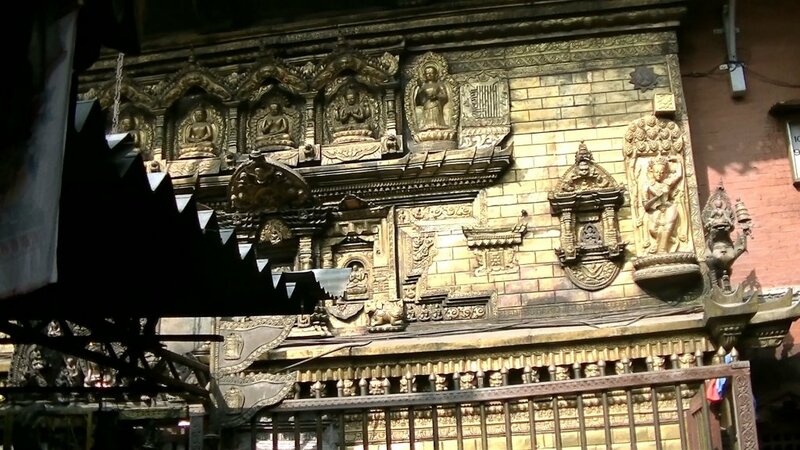 Characteristic of this temple are Shiva and his wife Parvati, who are watching the life at the Durbar square from their window. 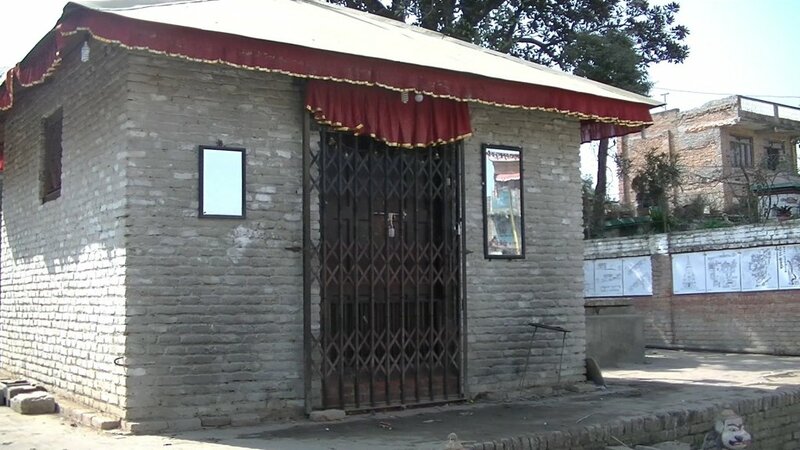 The temple was built in the late 17th century. 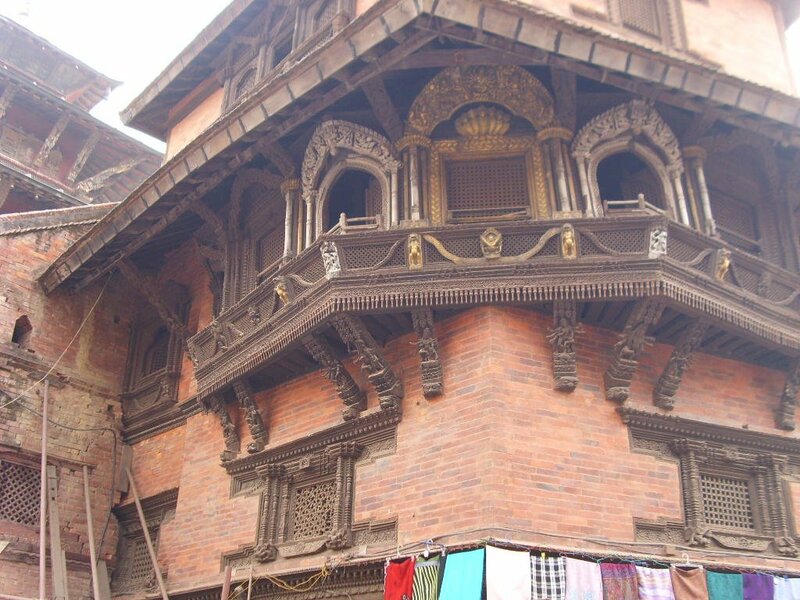 Another important building at the Durbar Square is the Kumari Bahal, also called Kumari Ghar or Kumari Che. 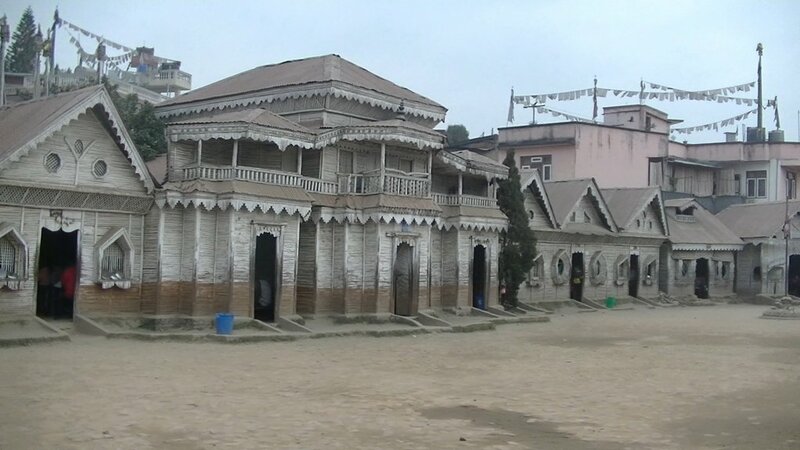 In this palace, which was built in 1757 by king Jaya Prakash Malla, is residing since that time the Royal Kumari, a living goddess, who is beliefed to be the incarnation of the goddess Taleju. 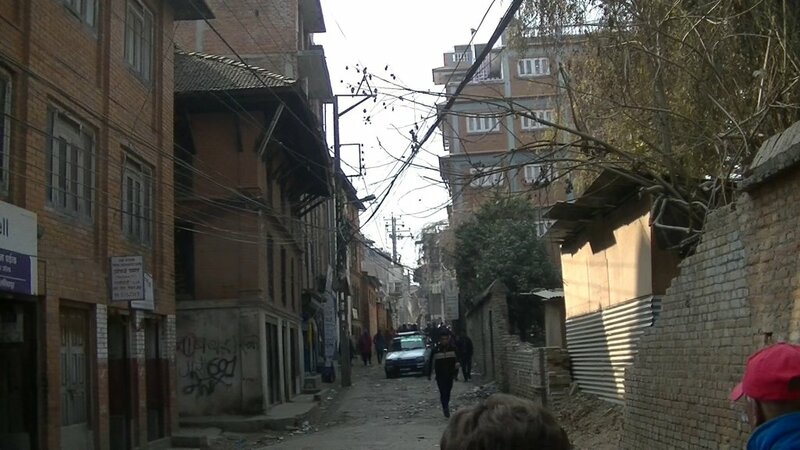 Through the crouded streets of the old town of Kathmandu, passing the Annapurna Ajima Temple at Asan Tol, we walked back to our hotel and I was glad to leave the chaos on the streets of this city. As I lay in bed in the evening and thought about the day, the thought came to me: "What I've let myself in for something there! 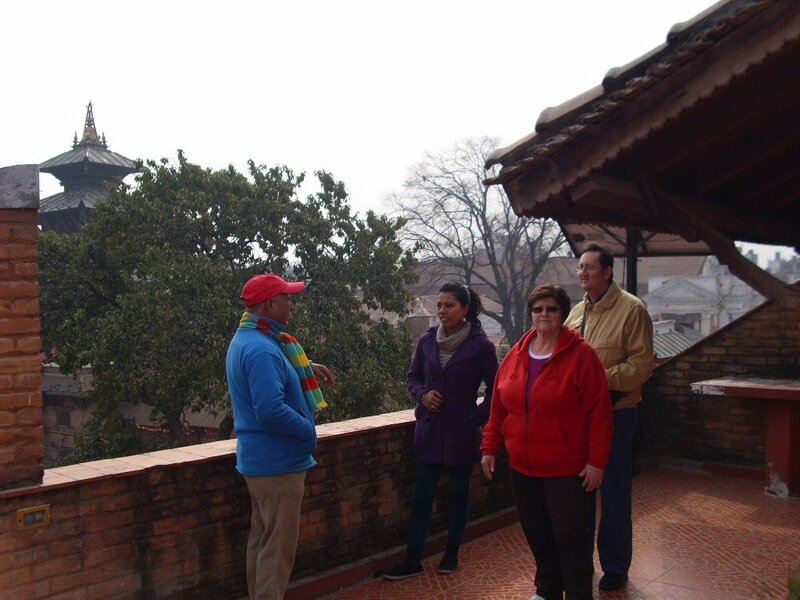 ..." But I wanted to go here so absolutely to meet Jamuna and her sister, to get to know the country and its culture and to see the girl, that first caught my interest of Nepal and its culture on that day in October 2008, with my own eyes. At 9:30 we again met Ram and Ram and drove to Bodnath. 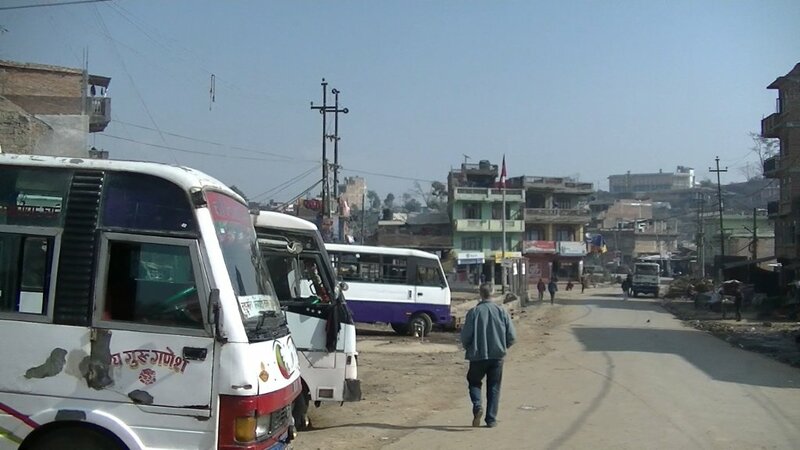 Bodnath is a suburb of Kathmandu, but today can be said, it's a quarter of Kathmandu. 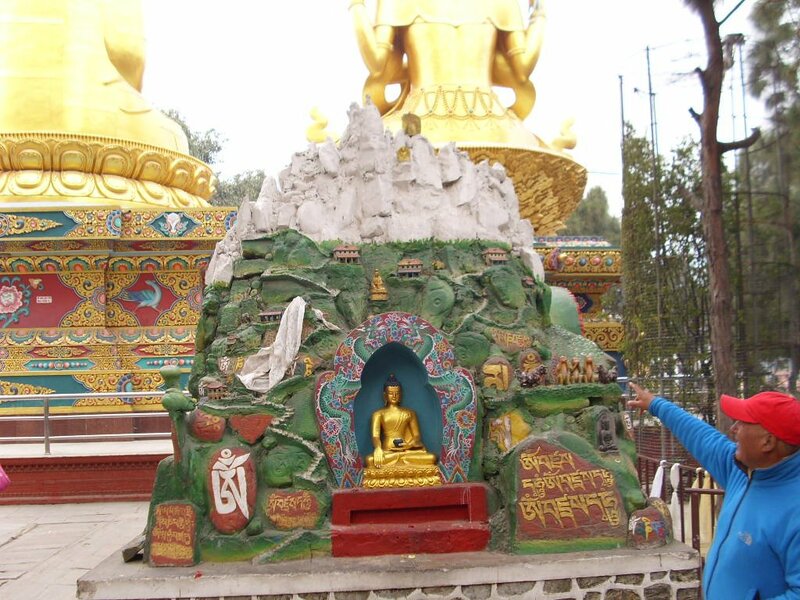 Here we visited the 36 metre high stupa of Bodnath, wich is one of the highest of its kind. 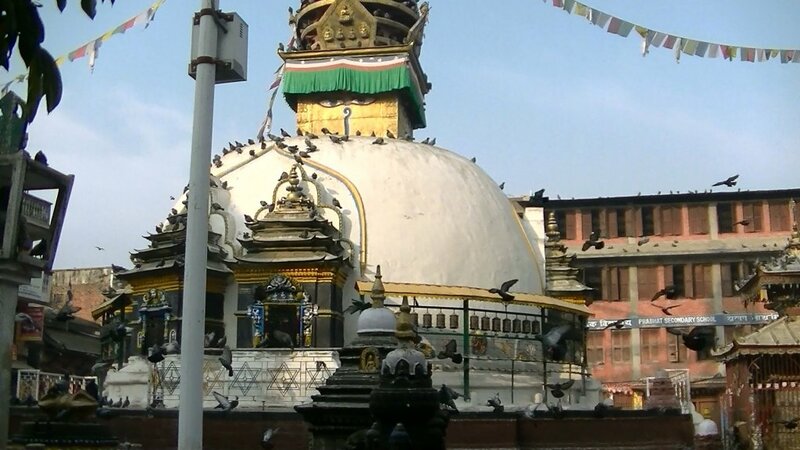 Bodnath, its founding dates back to the 5th century AD, is one of the most important destinations of Buddhist pilgrims from all over the region. 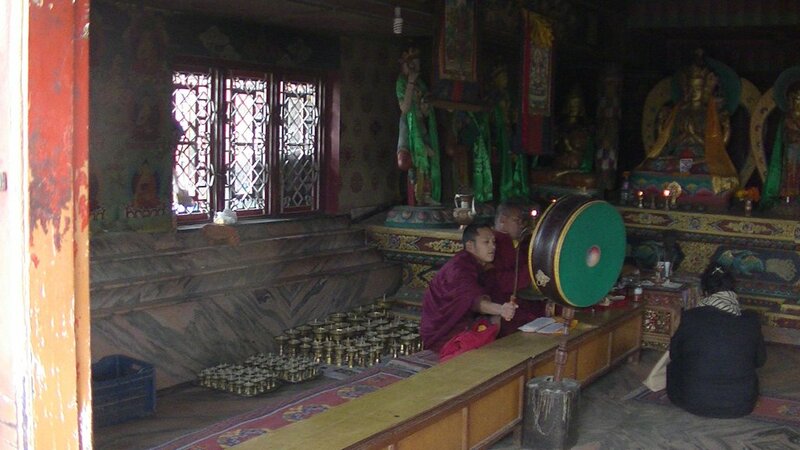 After the escape of the Dalai Lama from Tibet in 1959, Bodnath became a new religious centre for Tibetan Buddhism. 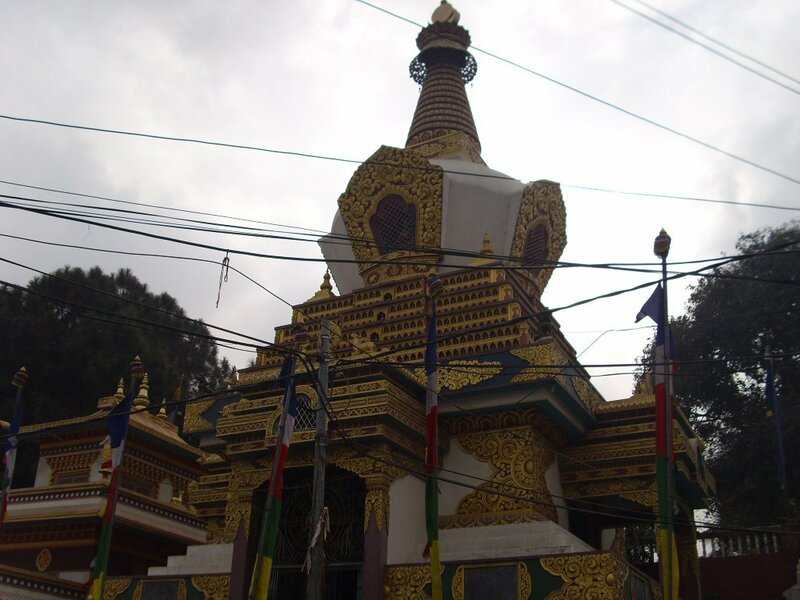 Here is residing the Cini Lama, the third highest religious dignitary of the Tibetans. Kangma, a supernatural being from the heaven of Indra, once was condemned to mortality as a punishment for a theft. She was reborn as a daughter of swineherds and early became a widow. She acquired a certain prosperty by goose herding. To build a sanctuary, she asked the kinf for as much land as she could fence with a single coat of a buffalo. The king agreed and she cut the coat of the buffalo to thin strips and could fence a large area. After the death of the goose-girl, her sons completed the construction of the sanctuary. 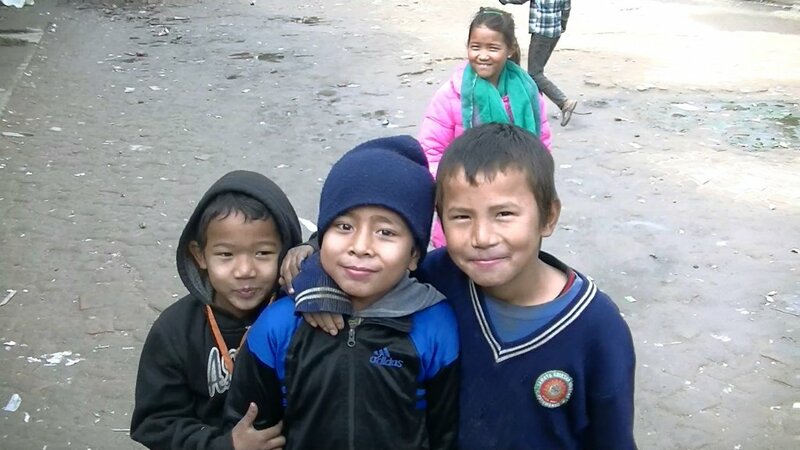 After a ten-minute walk through the streets of Bodnath, we reach the Samata School, part of a private education project with more than 10,000 students. 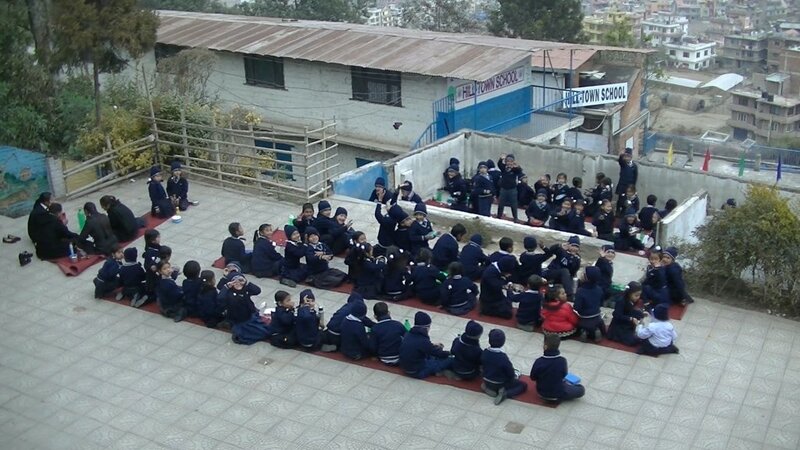 The founder of this project is Uttam Sanjal, whos goal is, to provide a school education to every child in Nepal. 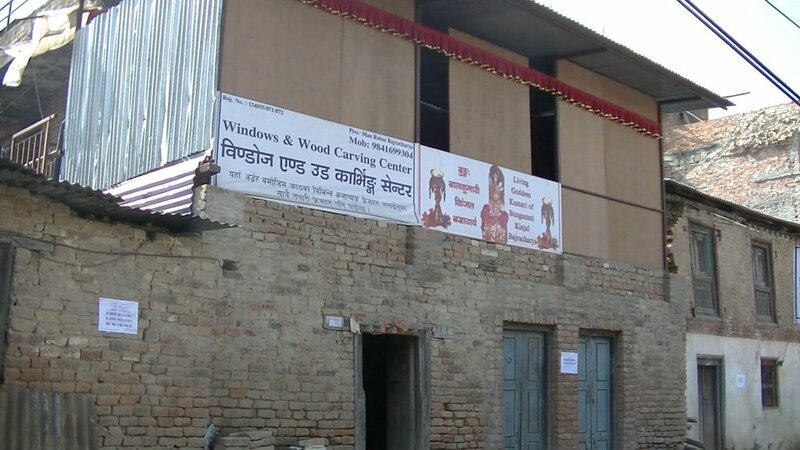 The school fee in this project is 100 rupees, less than 1 Euro a month. 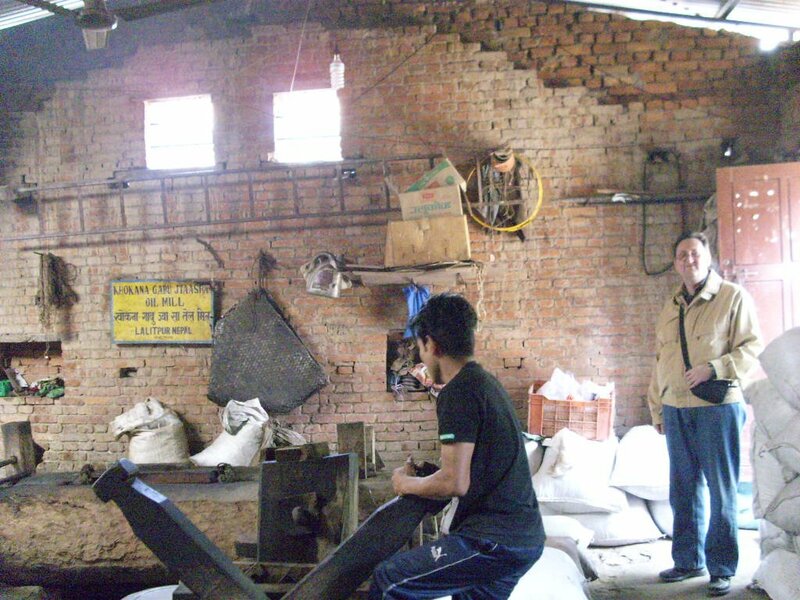 Many students are orphans, but also those, that were sent, or even were sold by their parents from the agricultural Terai to families in the city to work in the household under rightless conditions. 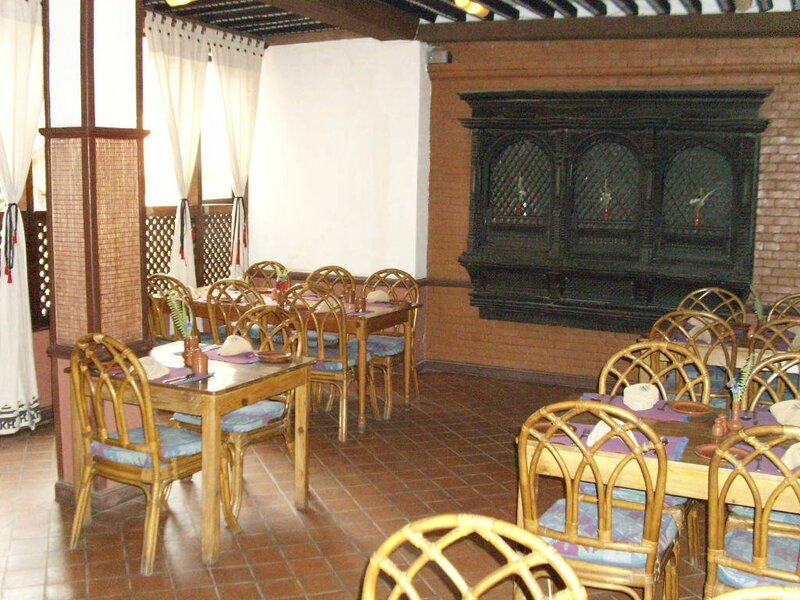 The salary of the so-called Kamalaris is mostly only food and accommodation. 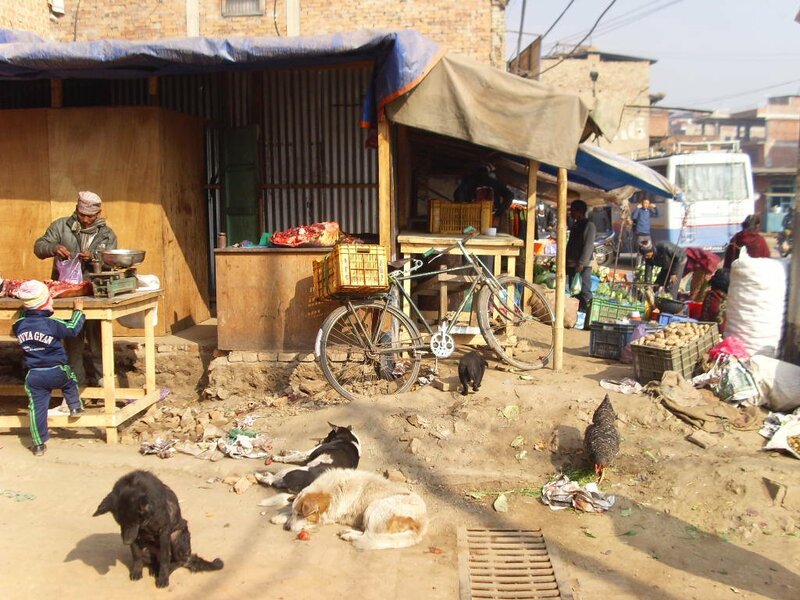 But due to their harsh working conditions, these kids come to school very irregularly. The classes are held in English and special emphasis is placed on learning the language, because without English skills, it is hardly possible to get a degree, or even a job. Special attention is paid to the social development of students, such as honesty, peaceful coexistence and concern for others. Samata School built of bamboo, because that also called "Bamboo school"
After this impressive experience we drove to the temple complex of Pashupatinath, one of the major temple sites of Hinduism. 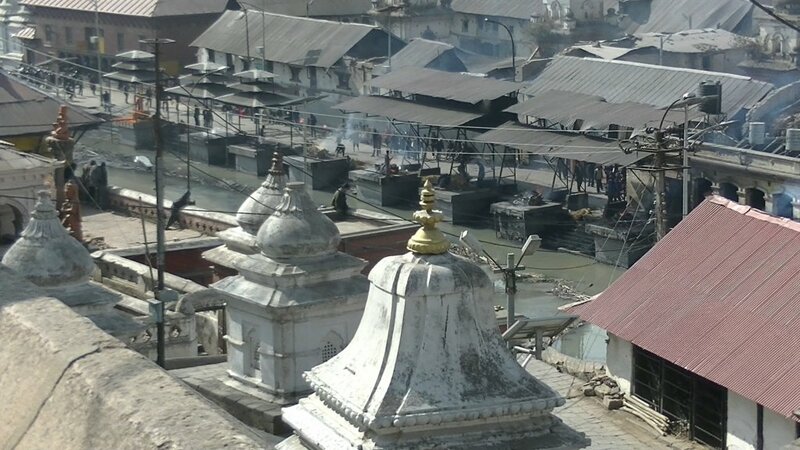 Pashupatinath literally means Master of life, or Master of all that lives. 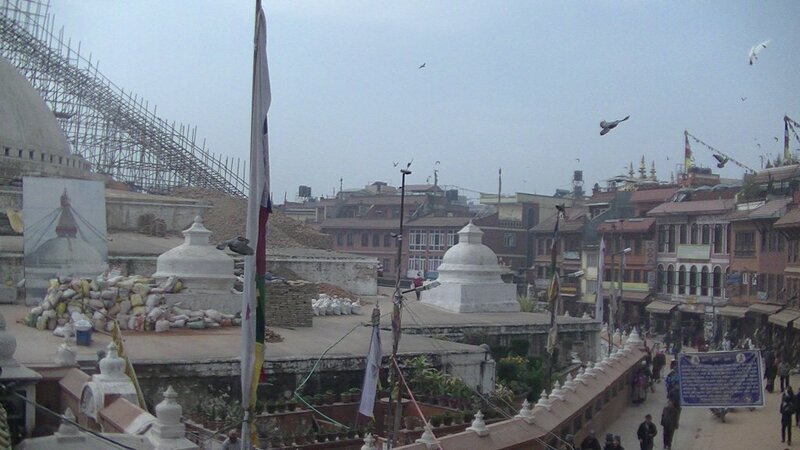 The temple complex is located on the holy Bagmati River. 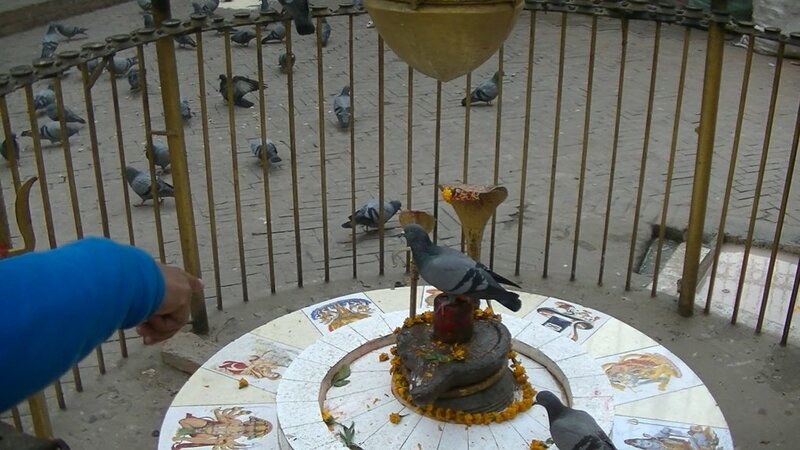 Lord Shiva is worshipped here as Pashupati. 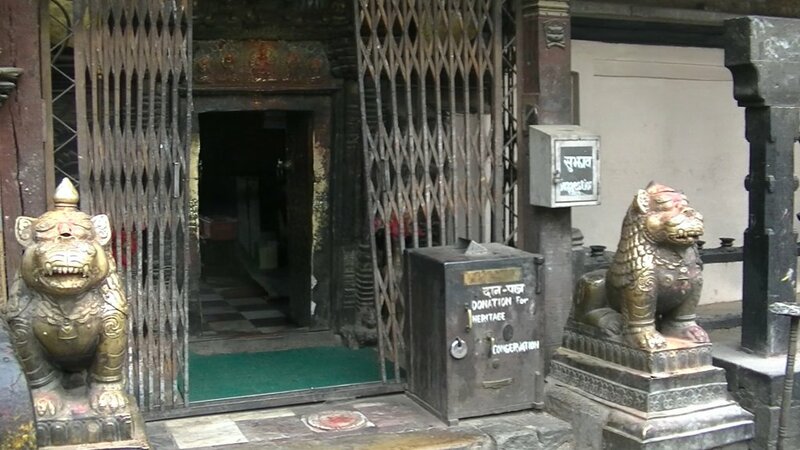 While the temple area is accessible for everyone, the actual Pashupati Temple is only allowed to be entered by Hindus. Although a sacred site is believed already in pre-Christian times, the temple was built in the 5th century. 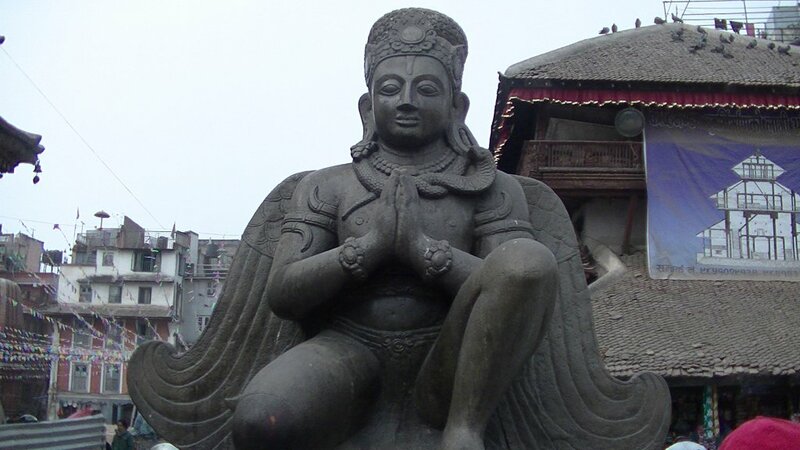 A 1.80 m high statue of Shiva is located inside the temple. 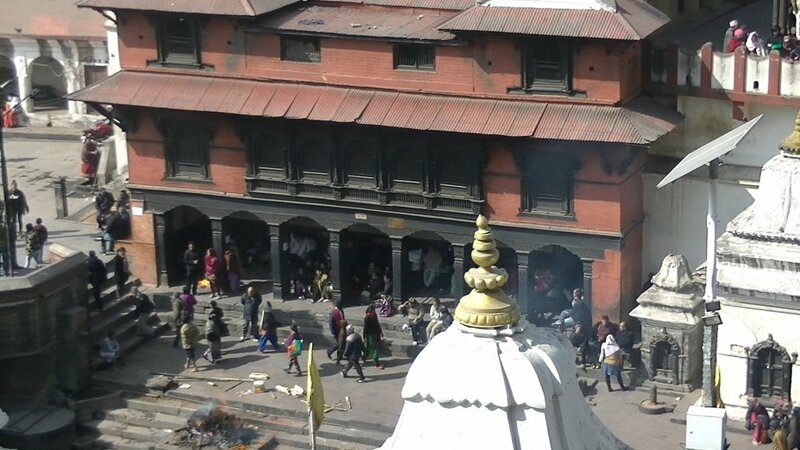 Every year in spring thousands of Hindu pilgrims from far and wide, come here to celebrate the Festival of Shivaratri. 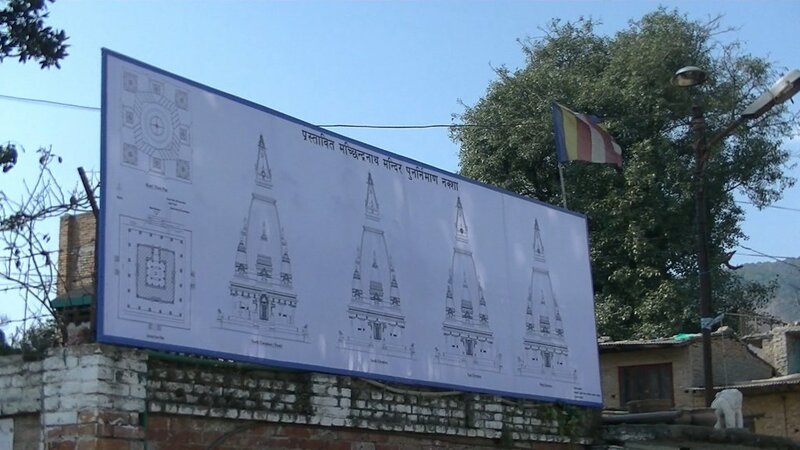 At the right river bank of the Bagmati River, which divides the Temple district into two halves, the incineration facilities, Arya Ghats (incineration facilities of the higher casts) and Surya Ghats (incineration facilities of the lower casts) are located. Today, we had an appointment with Jamuna and Ganga at 10:30 at Bungamati bus station. 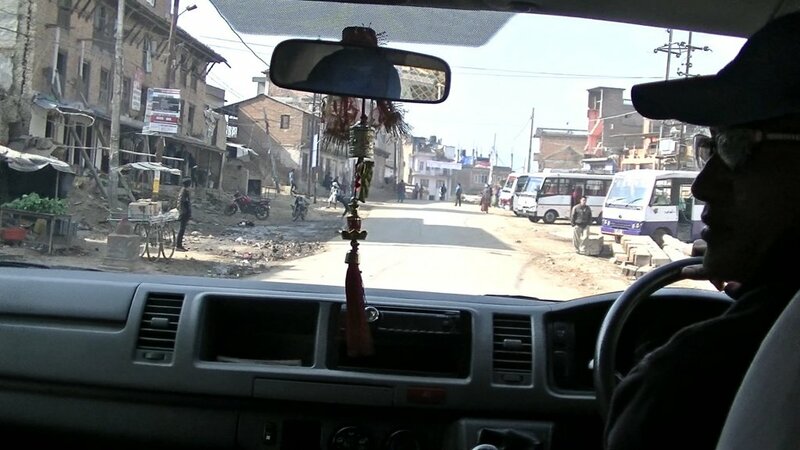 Ram, our driver, picked us up at 10:00 at our hotel and we drove to Bungamati, where we arrived at 10:20. Neither Jamuna nor Ganga was there. Well, they have still 10 minutes time. It's 10:30 and no one was there. Also at 10:45 and 11:00 no one appears. And nothing was to see of Jamuna and Ganga at 11:15 too. My father said, that they will not come. And finally Ram brought us back to the hotel. 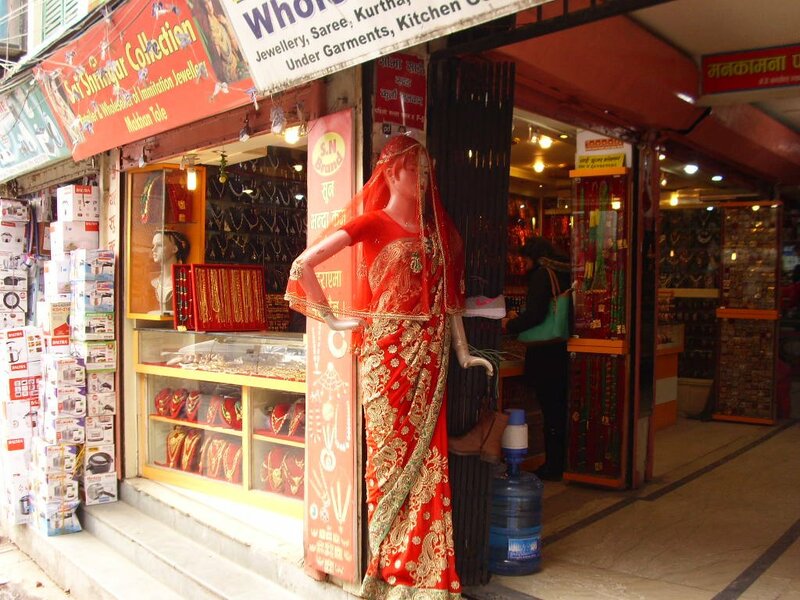 After arrival we walk through Thamel. I was absolutely upset about Jamuna and Ganga that they stood us up, because I extra organized a free day and the driver for this Saturday, when Jamuna and Ganga have a free day too. Again they stood me up as like on Wednesday. When we came back from our walk, we already were welcomed at the front desk of our hotel. Someone called for me and left the number. It was Ganga. 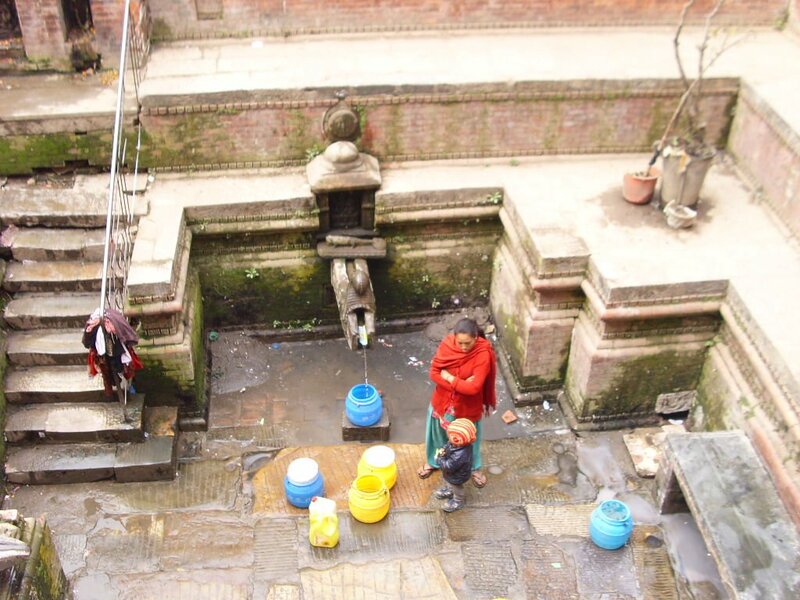 Shortly after we were in the hotel room, Ganga called again to ask what's going on. "Why you didn't come? We have been waiting for your call to pick you up at the bus station." "Call? We wanted to meet at the bus station at 10:30. Where have you been? 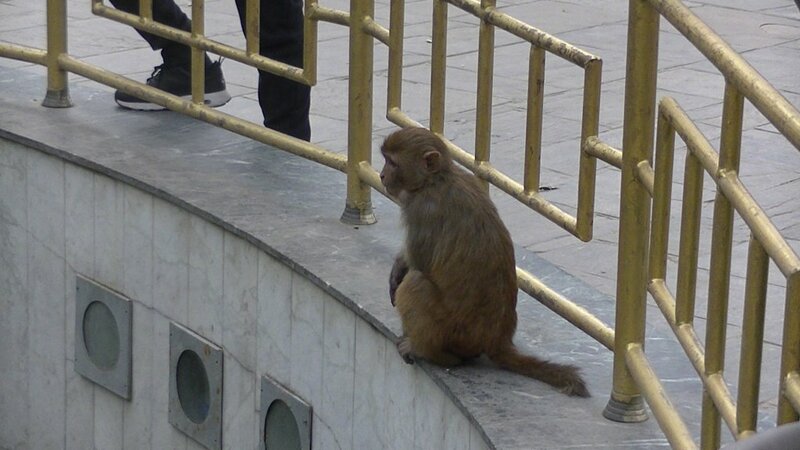 We have been waiting for an hour there, but none of you were there. Now we're back at the hotel." We finally have agree to meet at 15:30 at the hotel. A little time before our appointmentI I went down to the lobby and waited. Some time later my parents came there too and we joined a table in front of the hotel and ordered a coffee. I already was afraid that they stood me up again, but finally Jamuna arrived. Ganga joined us little later and we spent a wonderful evening together with my parents. 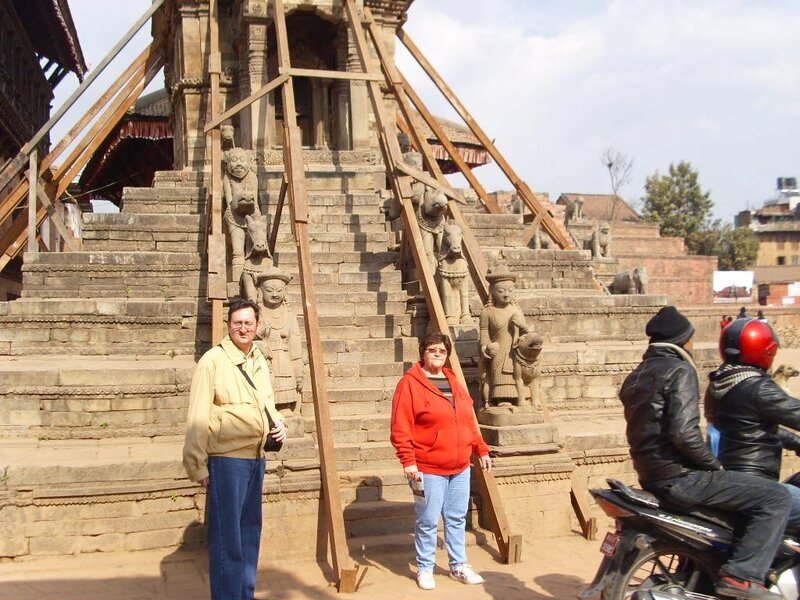 On todays agenda was Bhaktapur, which means "City of the devotional", Bhaktapur is the smallest of the three imperial cities in the Kathmandu Valley. 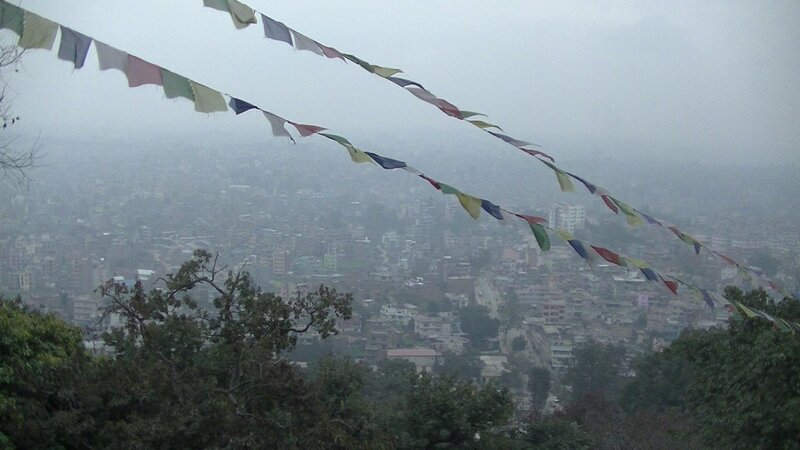 The city has about 82,000 inhabitants (2011) and is located on the river Hanumante Khola. 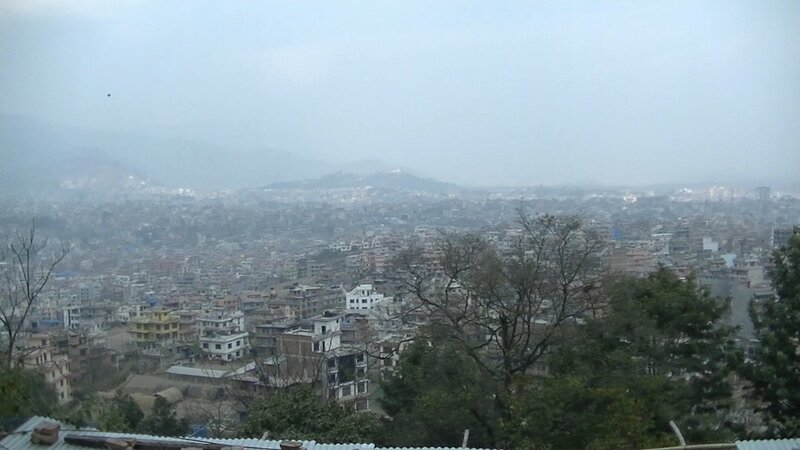 The cityscape is dominated by agriculture, pottery and a vibrant traditional music scene, It is also known as the capital of the performing arts of Nepal. 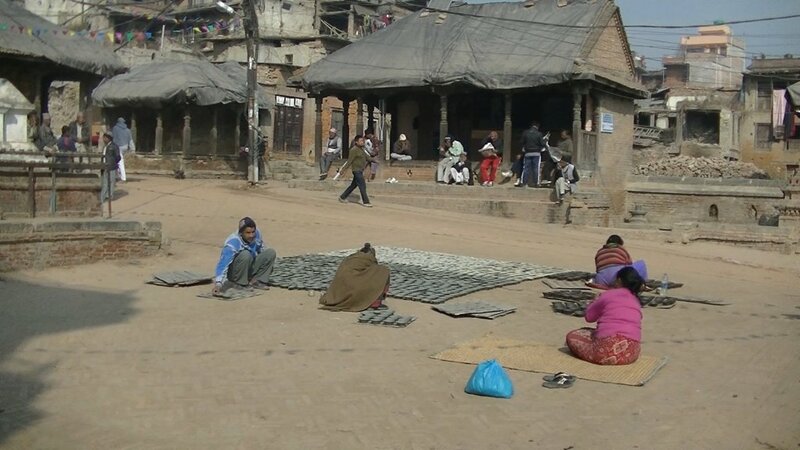 Most of the inhabitants of Bhaktapur are Newar. 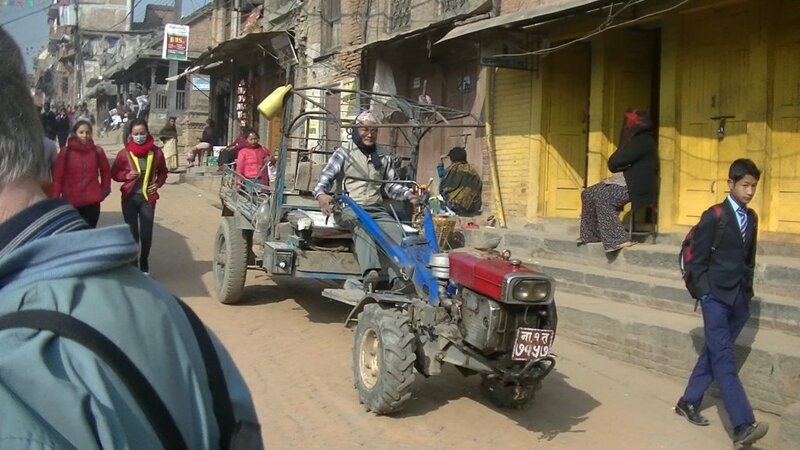 60 percent are farmers of the Jyapu caste. 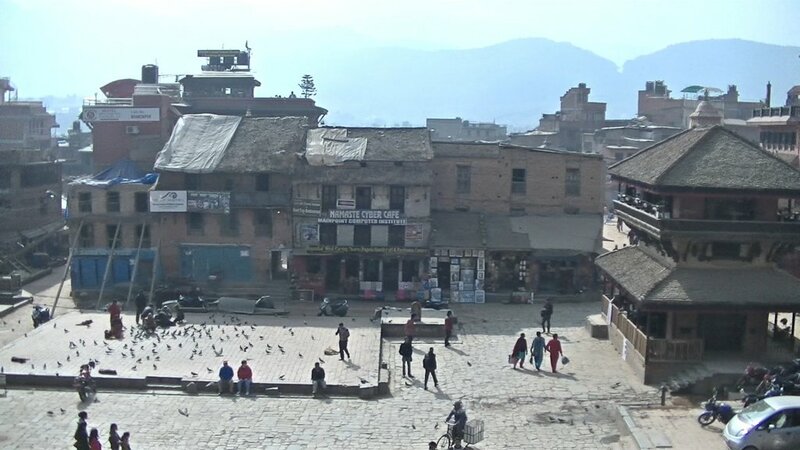 The Dattatraya square is situated in the east of the city. 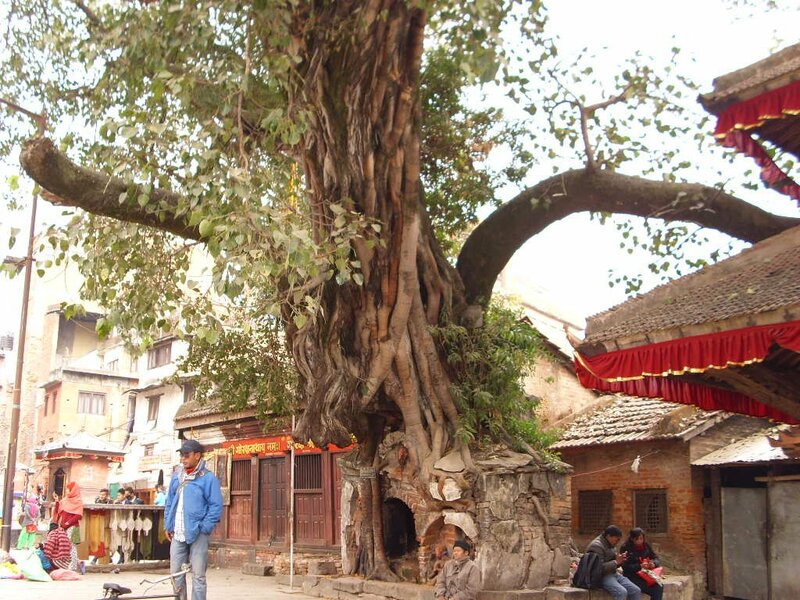 With its 80 x 25 metres it probably already had a central function at the time of founding of Bhaktapur. 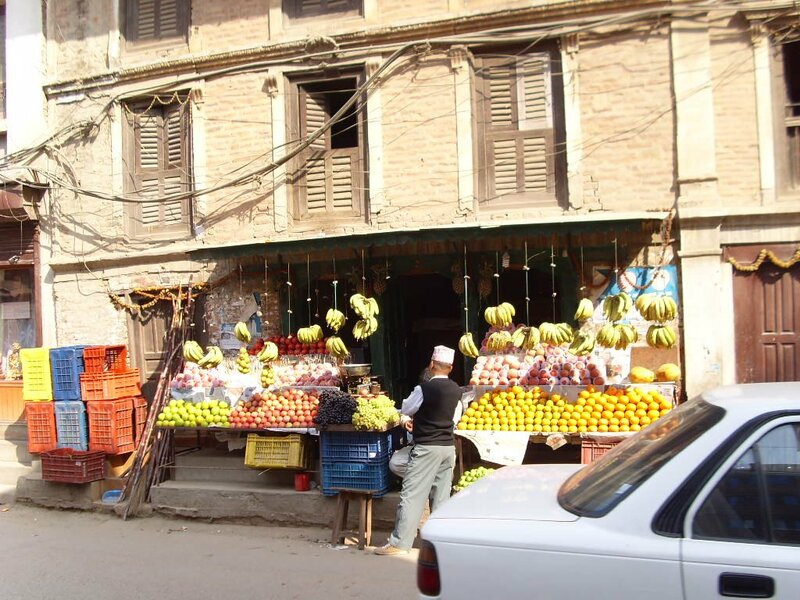 At that time, in 7th century BC, the city still had the name Khopo. Today, it forms the centre of the upper town. 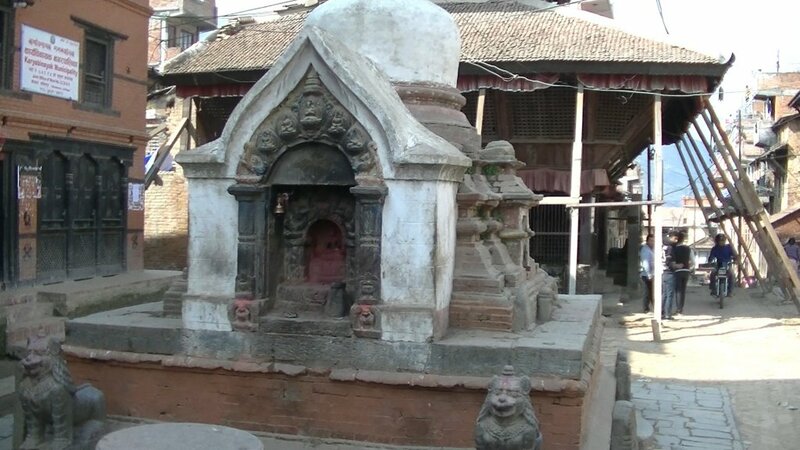 Here is located the Dattatreya Temple, which gave the square its name. 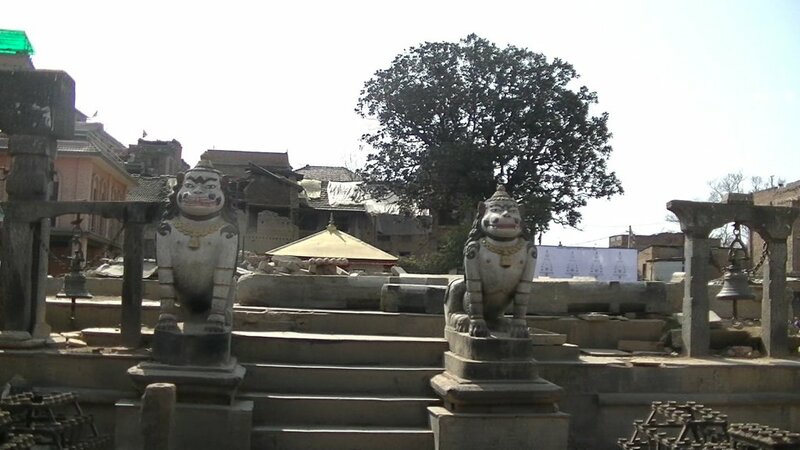 It was built in 1427 and is dedicated to Dattatreya, wich is a mix of Brahma, Vishnu and Shiva. 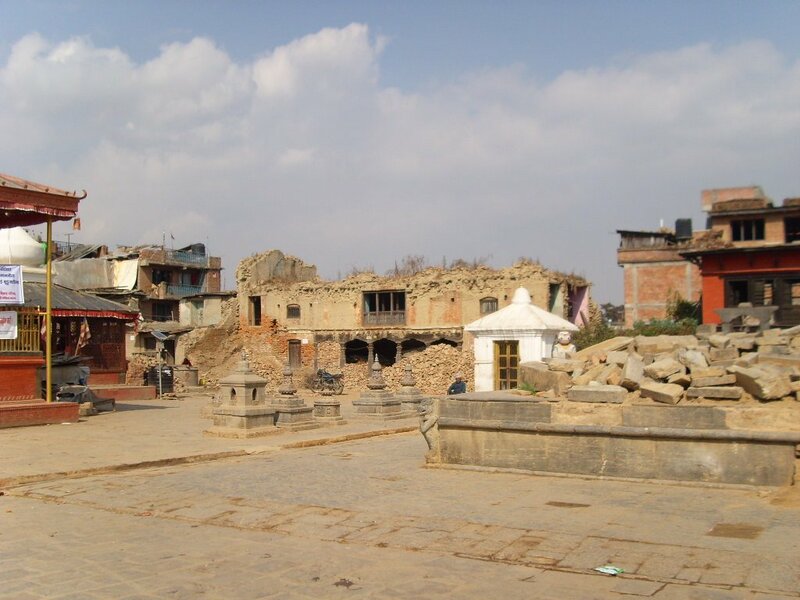 For centuries, it resists earthquakes and many other disasters. 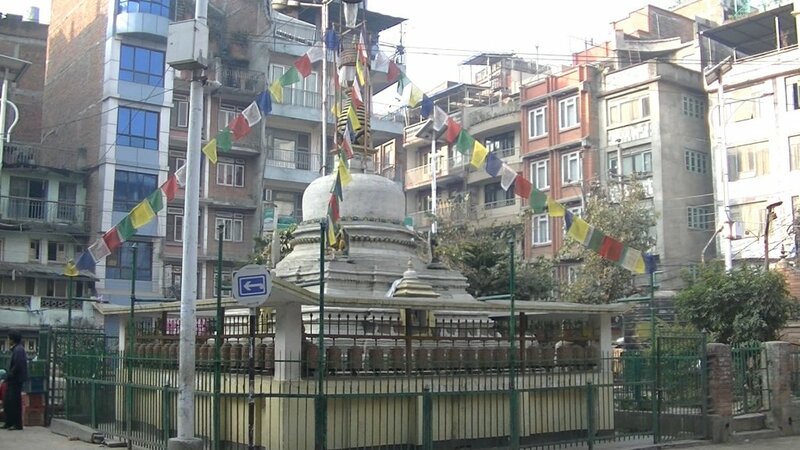 The Taumadhi square, which forms the centre of the lower city, is located in the West of the city. 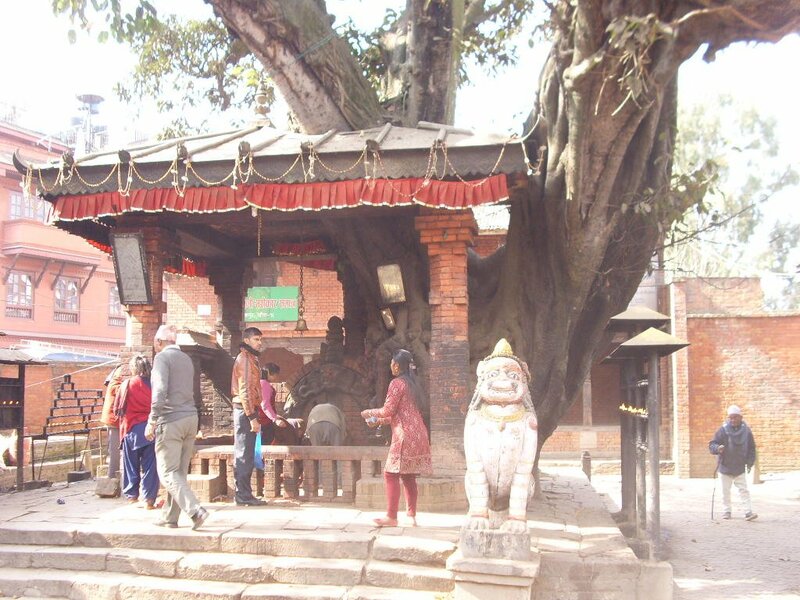 The Nyatapola Temple, with its 30 metres the highest Temple of the Kathmandu Valley, is located here. 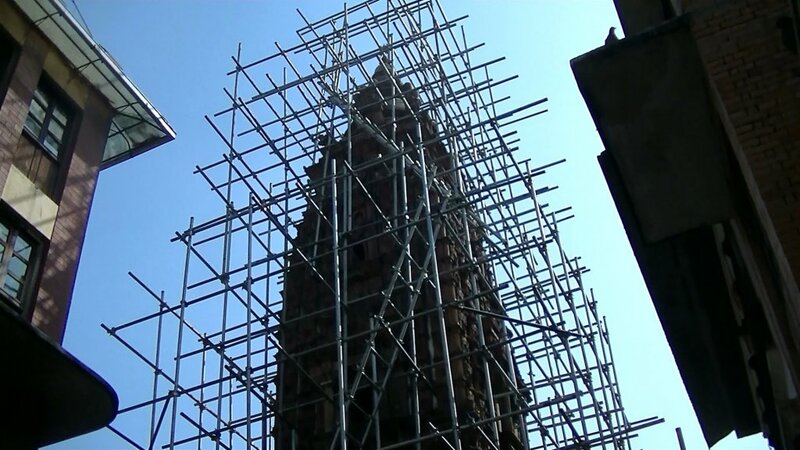 It is dedicated to the goddess Lakshmi and was completed in 1708. 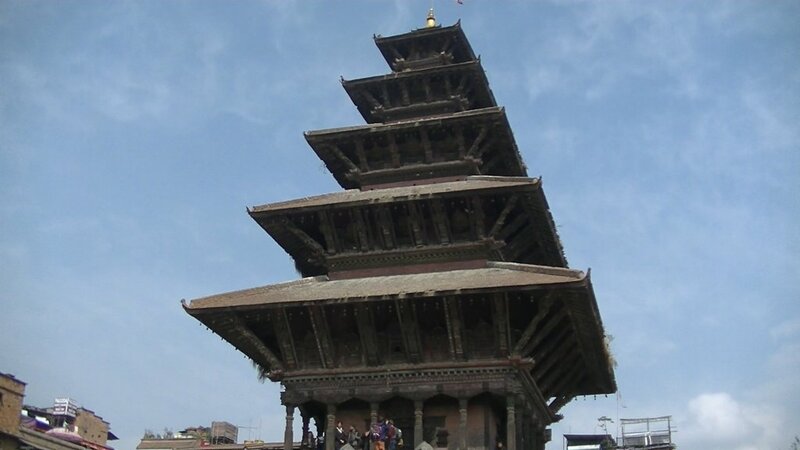 Due to its construction, it resisted the great earthquake of 1934 and also the two earthquakes of 2015. 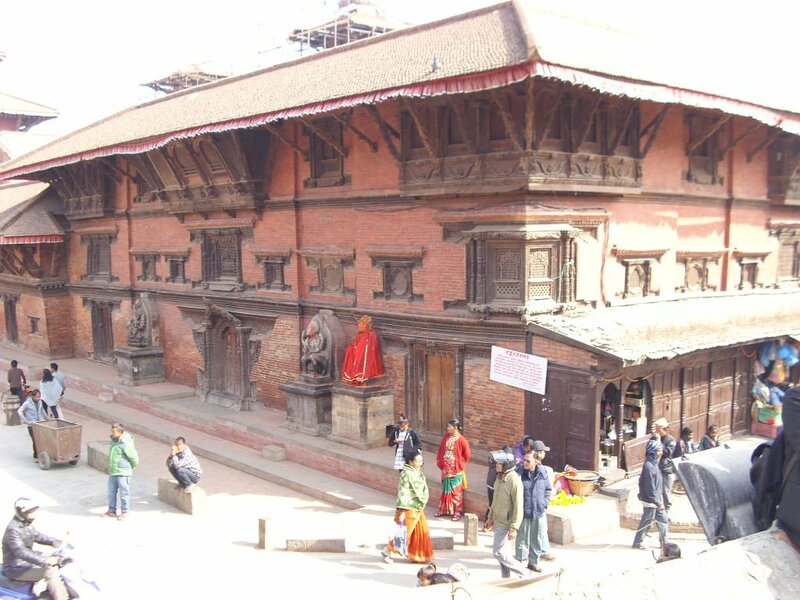 Northwest from Taumadhi square is the Durbar square of Bhaktapur. 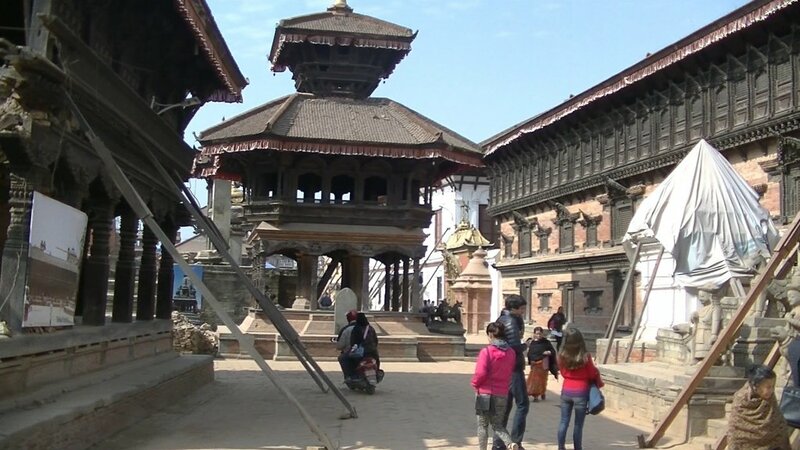 Due to its political irrelevance and serious damage in the earthquake of 1934 it is less magnificent than those in Kathmandu or Patan. 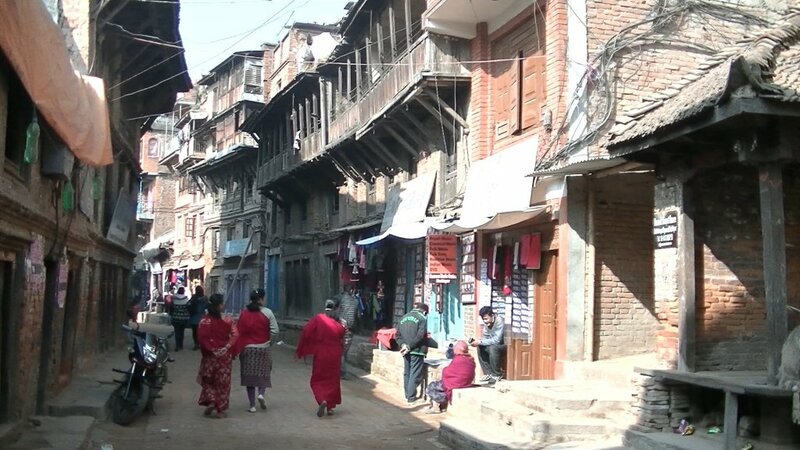 On todays agenda was Patan, the third of the imperial cities in the Kathmandu Valley. 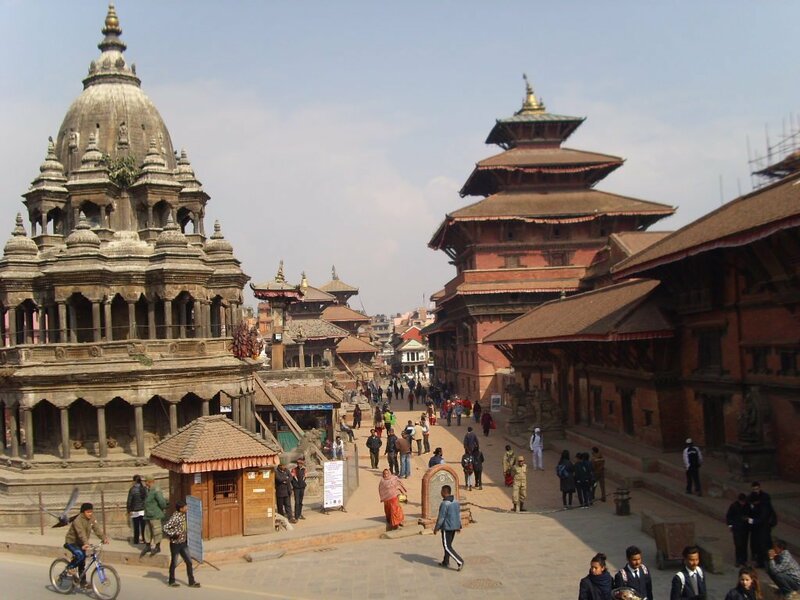 Patan in addition to Kathmandu and Pokhara is Nepal's third largest city and the capital of the Lalitpur district. 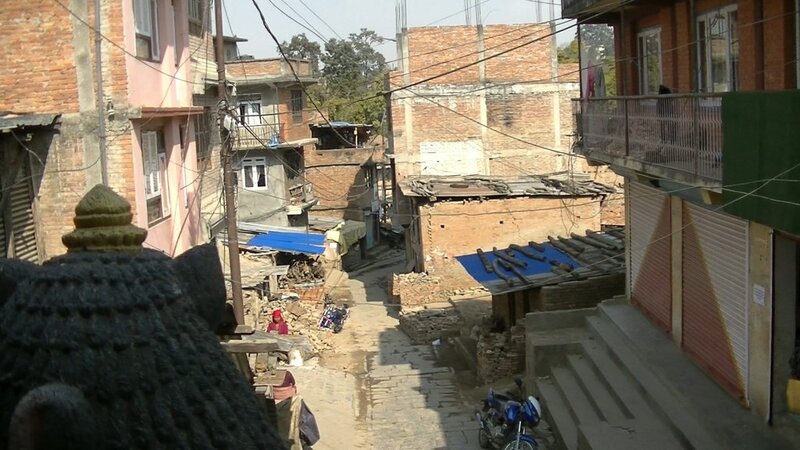 Patan has approximately 254,000 inhabitants (2011). 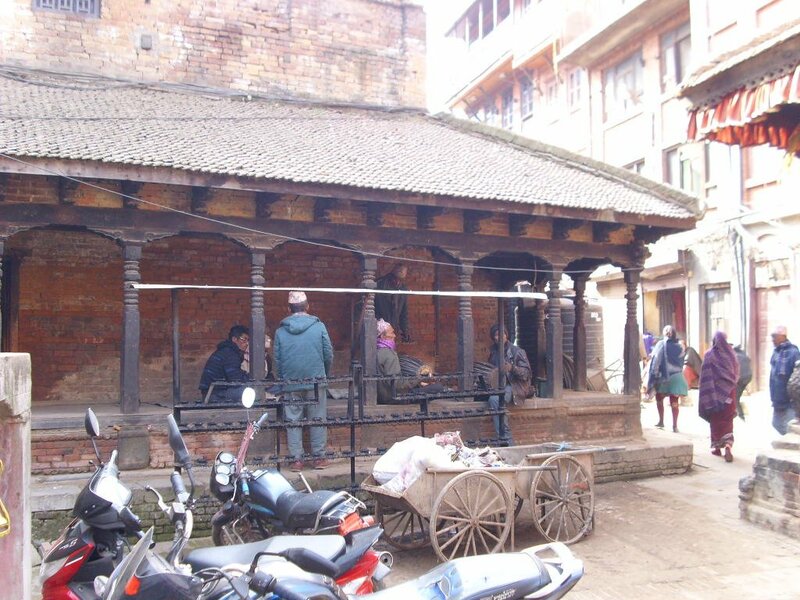 Patan is more than 2,300 years old and was the tenth largest city in the world at about the year 1000 A.D.. 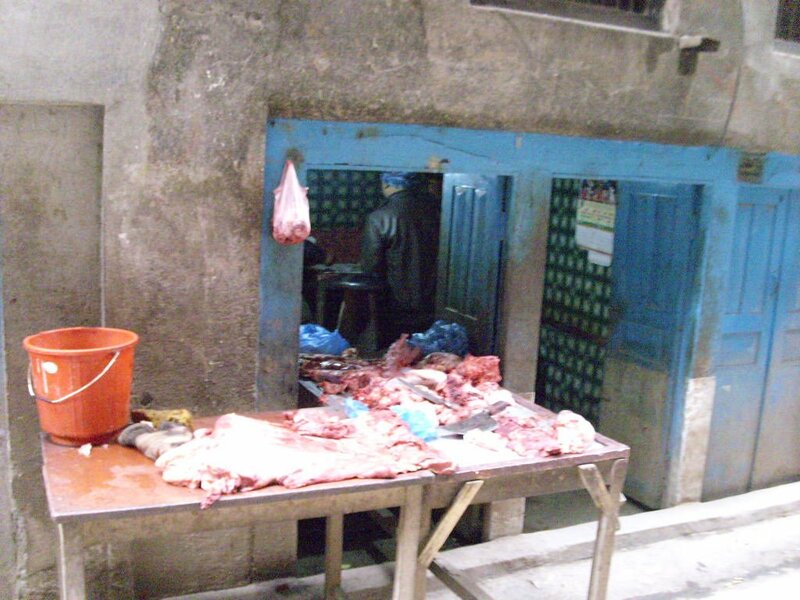 The city is known for its numerous and beautiful courtyards. 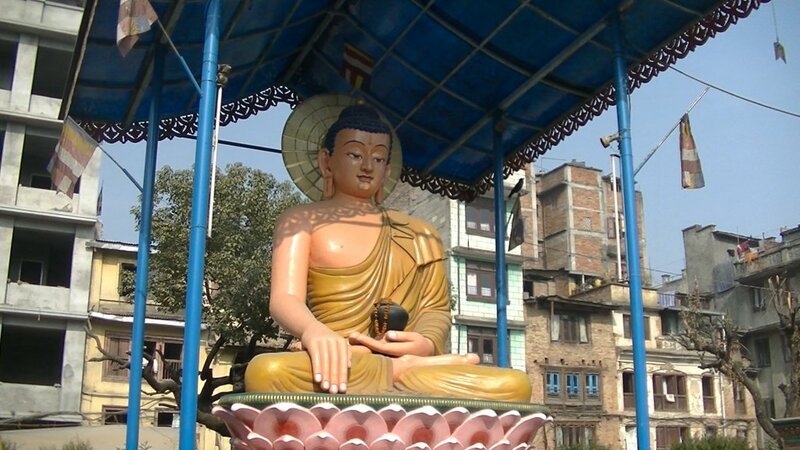 The Mahabuddha Temple is dedicated to Siddhartha Gautama and was built in 1585 by priest Abhaya Raj. 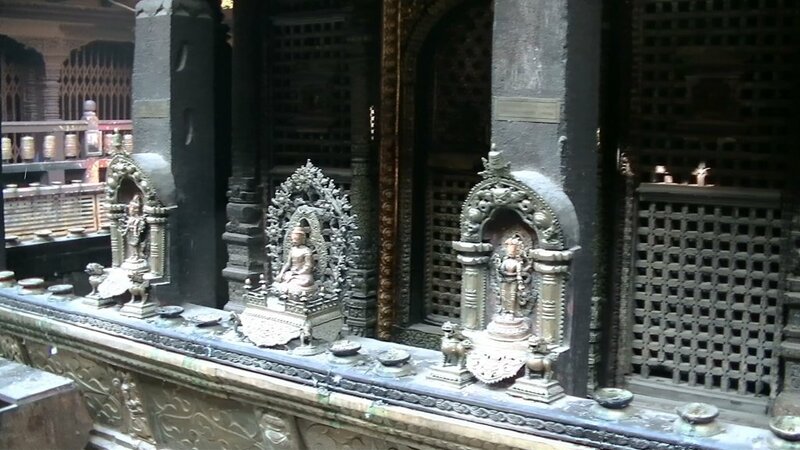 It is also called Temple of the thousand Buddha, because you can see a picture of Buddha on each stone of the temple. 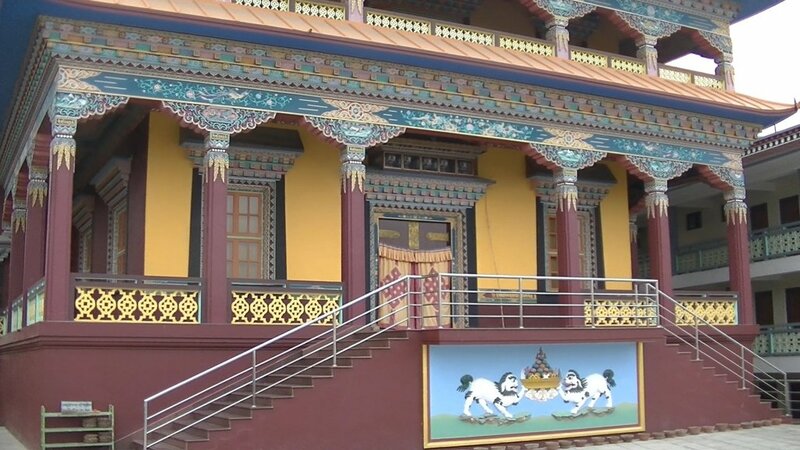 The Hiranya Varna Mahavihar, or Golden Temple, is a Buddhist monastery. The three-storey golden pagoda was built in the 12th century by King Bhaskar Varman. 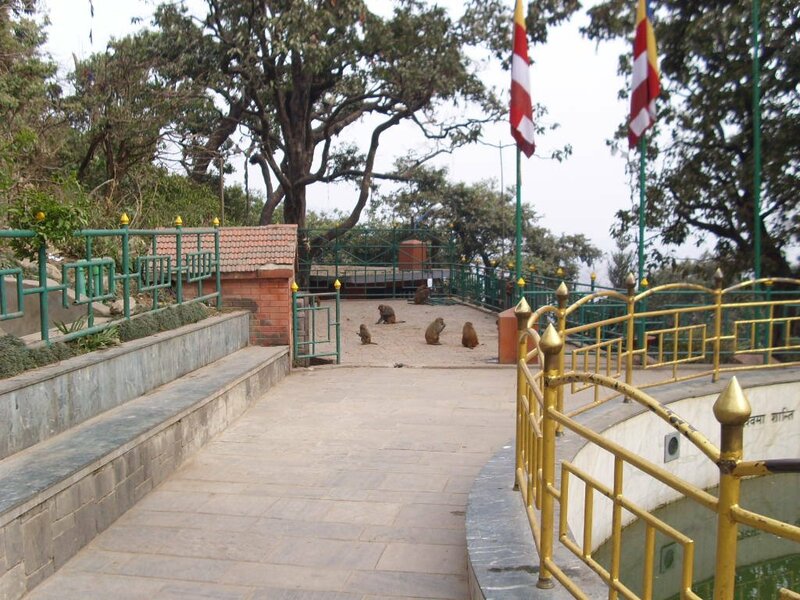 According to the legend there was a mouse named Hiranya at this place, whos eyes sparkled like diamonds. 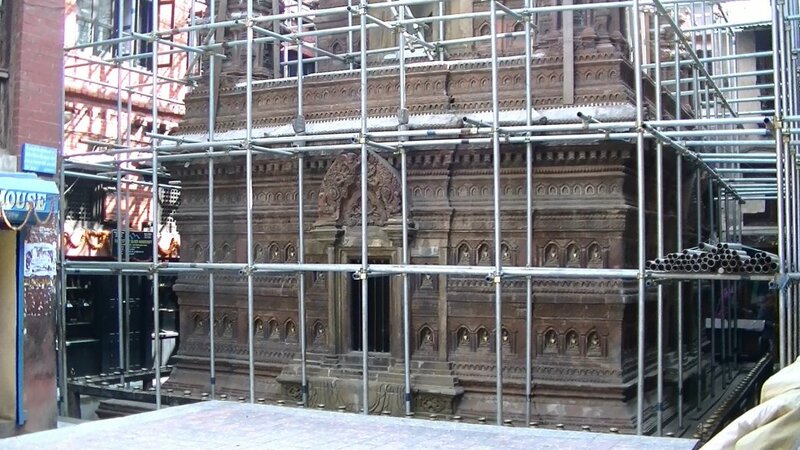 With the yesterday's trip to Patan actually the "official program" was completed and the following days were provided for activities with Jamuna. But unfortunately Jamuna didn't get permit of her boss for having free days to be with me. 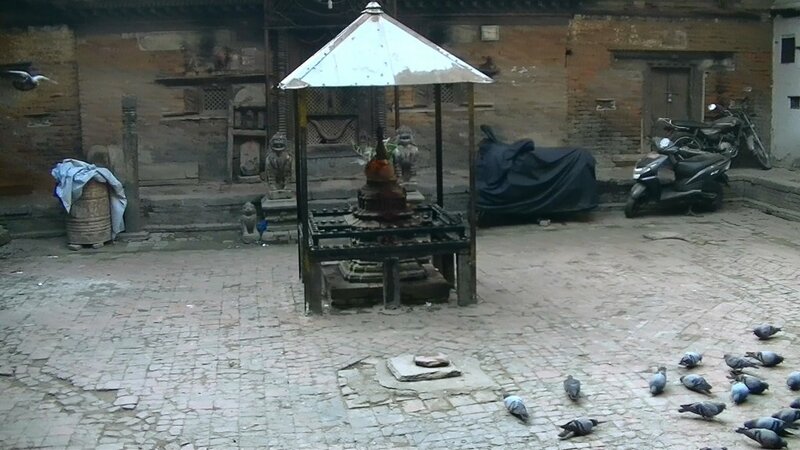 So alternatively I have managed this day again a walk with Ram to Durbar Square and to the Kumari Bahal, as well as the already-scheduled meeting with Ganga at her hotel for lunch. 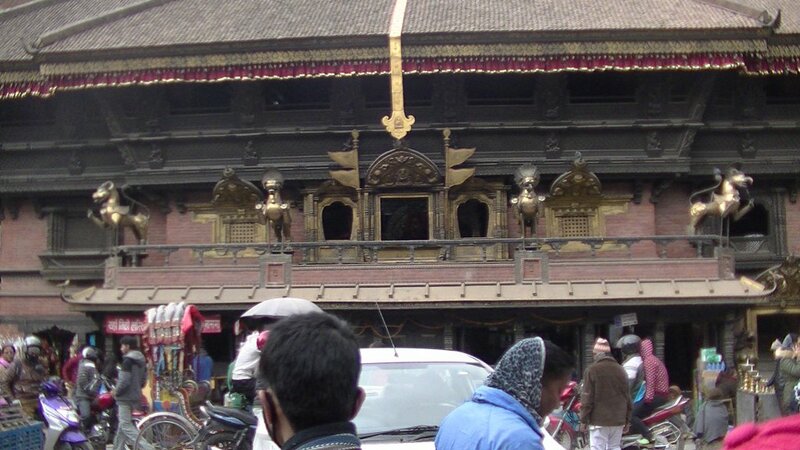 At 9:00 we met with Ram at the hotel and walked towards Durbar square. 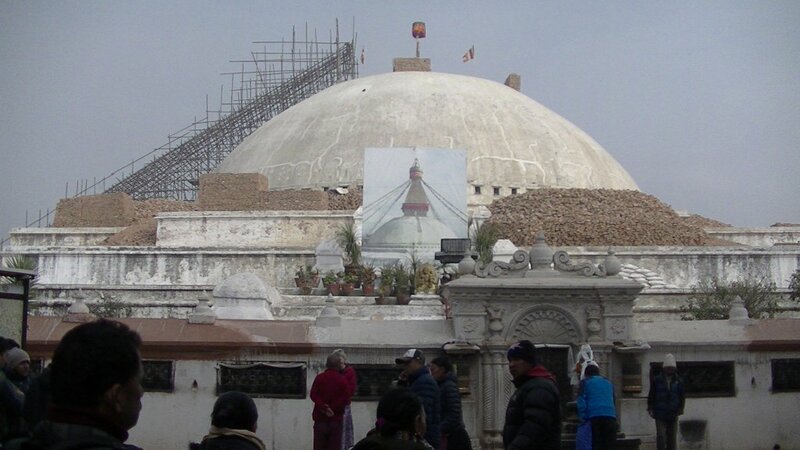 We passed the Dharmadhatu stupa and the Kathesimbhu stupa. 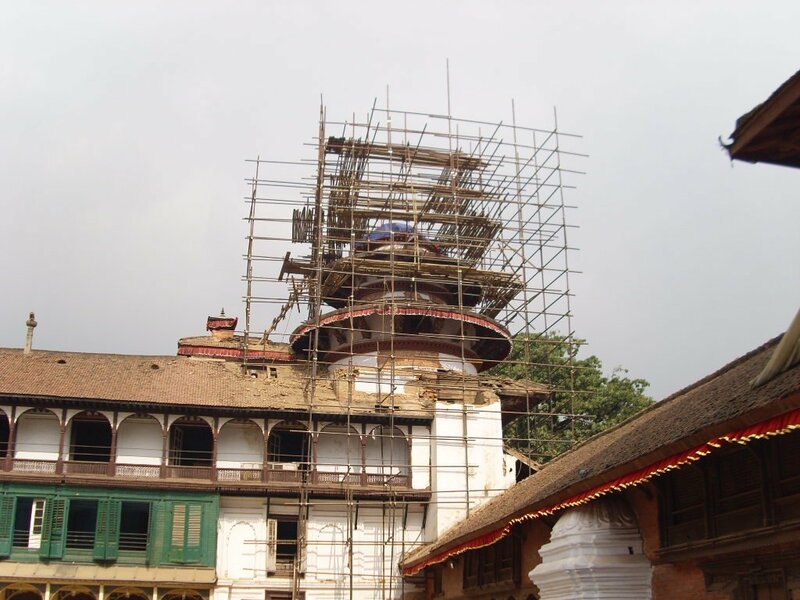 The Kathesimbhu stupa represents a small copy of the great stupa of Swayambhunath and was probably built in about 1650. It was barely damaged by the earthquake 2015. 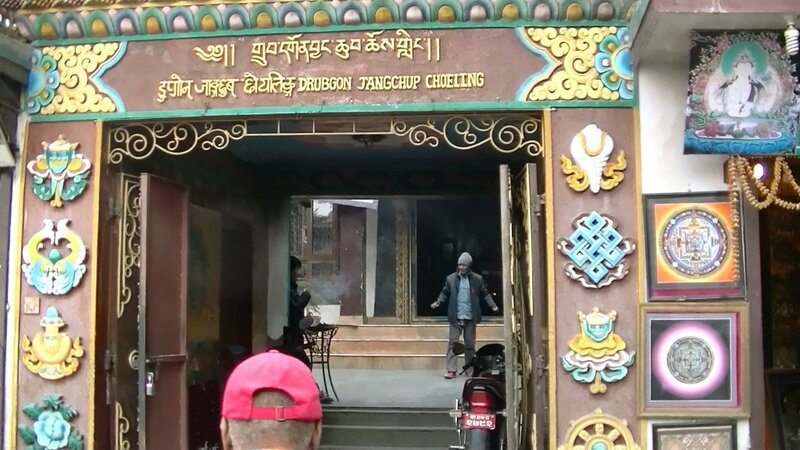 Not far away is the Drubgon Jangchup Choeling monastery. 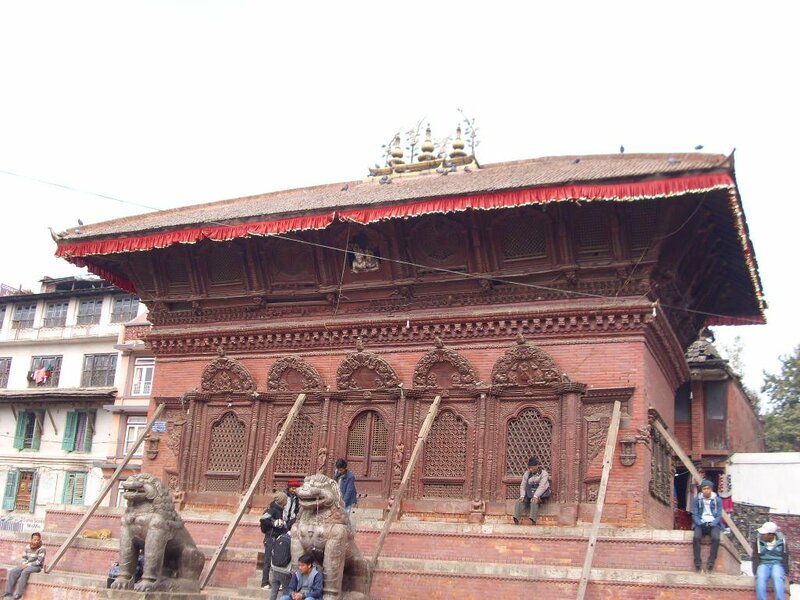 Finally via the Basantapur we came to the Durbar Square with the Kumari Bahal at the southern end of Durbar Square. 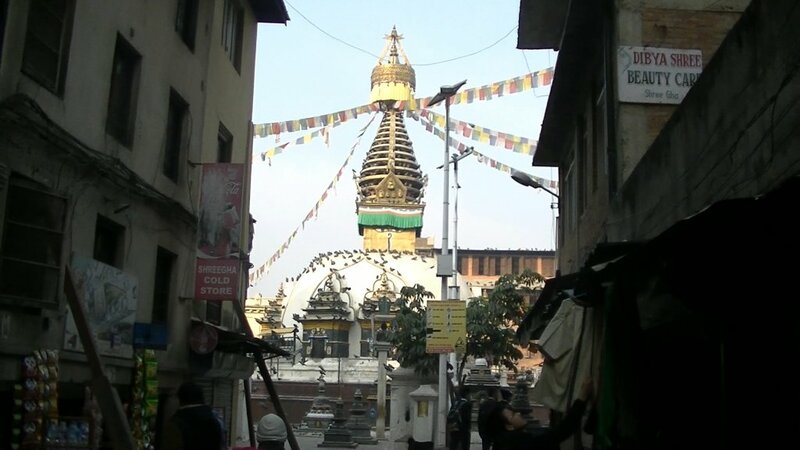 When we were there on Thursday, Ram explained us, that the Kumari only appears between 9:00 and 11:00 to be seen, so we were to late on Thursday, because we were at Swayambhunath in the morning. Today, we are here at the right time and we take the chance. Through the small doorway between the two lion statues, we entered the courtyard. There were a few people inside. Nothing was to hear of the traffic chaos outside. The courtyard gave the impression as if you were in the 18th or 19th century. 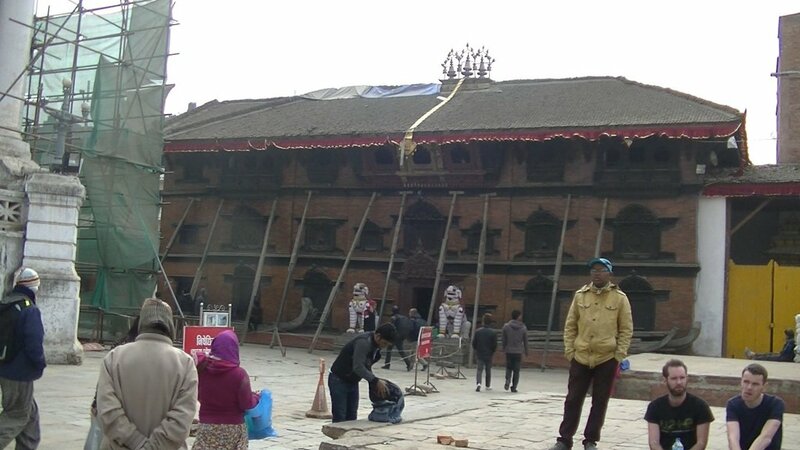 For decades nothing seems to be happened here and the supporting beams, that were installed after the earthquake of 2015, contribute their part to this atmosphere. Nothing is to see here of renovations. 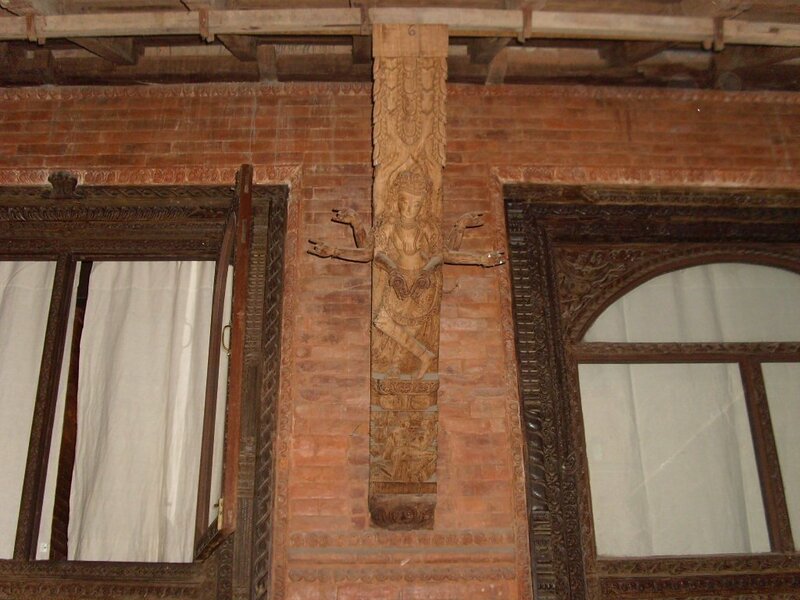 Ram spoke to someone in the upper floors of the House in Nepali, perhaps also Newari. You could see anyone, just listen to the answers. Ram ordered the few peoples around us to stop taking photos or filming. 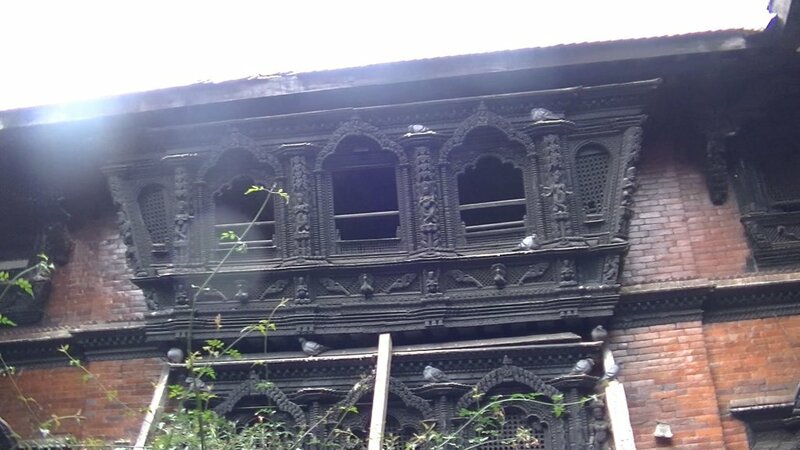 After short wait the Kumari appeared in the middle of the top three Windows. 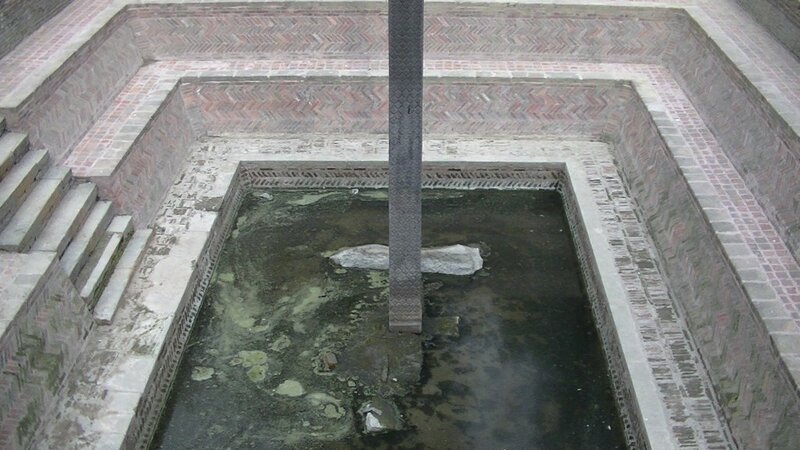 Seven years and three months after I came to this topic with Matinas appointment as the Kumari, I'm here in the courtyard of her temple and with my own eyes I can see her in the exercise of her function as the living goddess. After about a half minute all was over and she disappeared again. Under the just won impression we left the courtyard after the obligatory donation and climbed up to one of the surrounding rooftop restaurants. 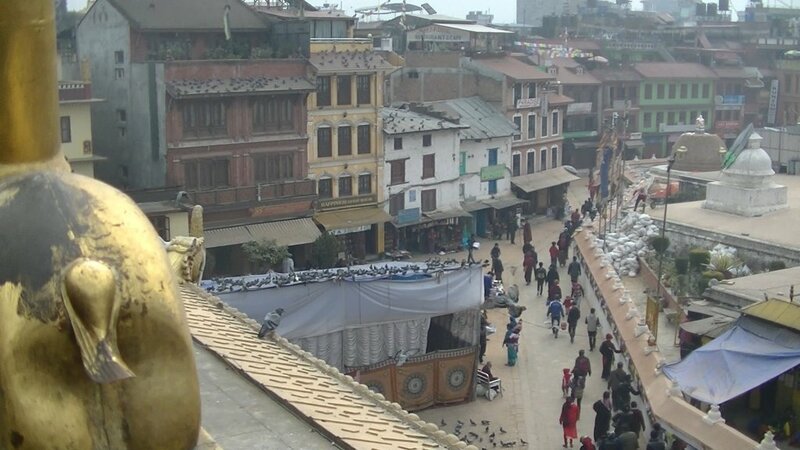 From here, we had a wonderful view down on the Durbar Square. 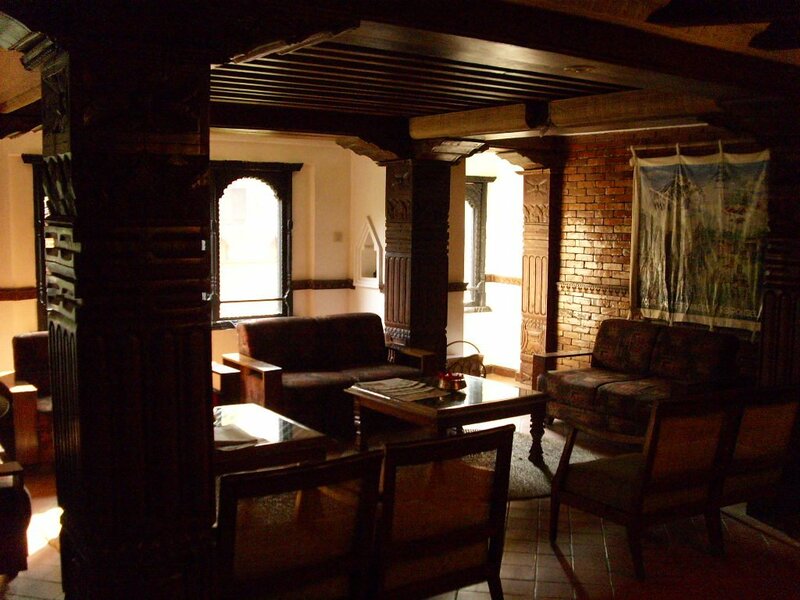 At 11 o'clock agreed to meet with Ganga and we went to the hotel where she is working. 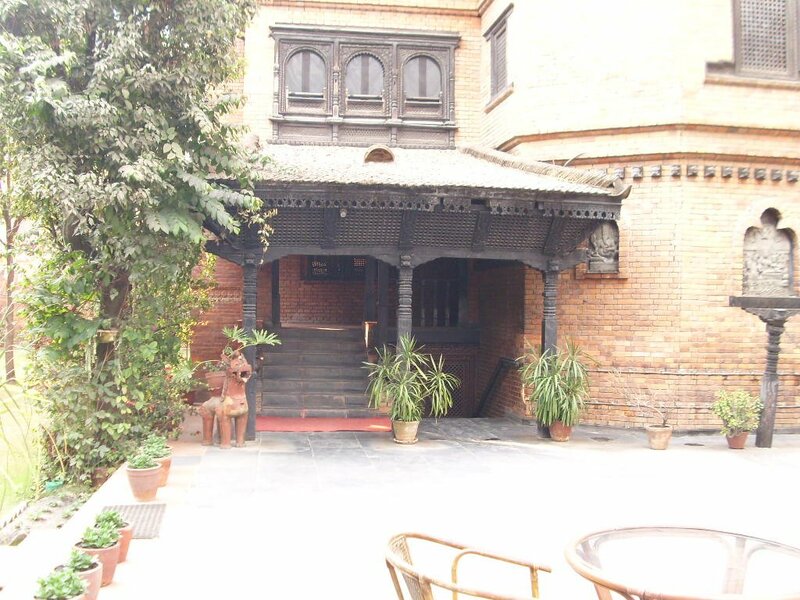 Originally I wanted to stay here while our trip to Nepal, directly at the Durbar Square, but unfortunately my travel agency didn't work together with this hotel. 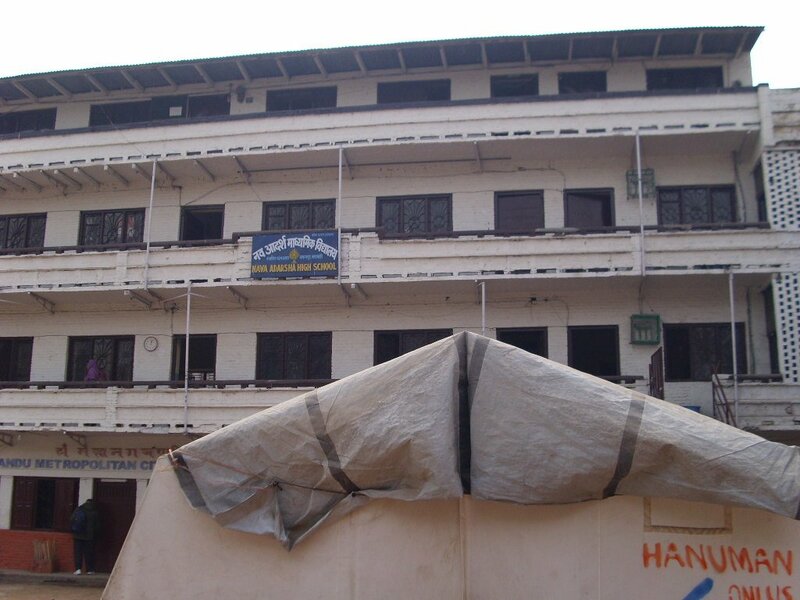 But for my next Nepal trip I'll try to stay here. Ganga took us through the hotel and finally we sat in the courtyard for lunch. Ganga unfortunately had to work, and so she couldn't join us to have lunch together. After Jamuna could get at least part of the day free, we agreed a dating with Jamuna and our driver for 10 o'clock at our hotel to drive to Bungamati, this time together. After the desaster on Saturday, today Jamuna was more than on time. In Bungamati our driver parked nearby Jamunas house and was waiting for our return. 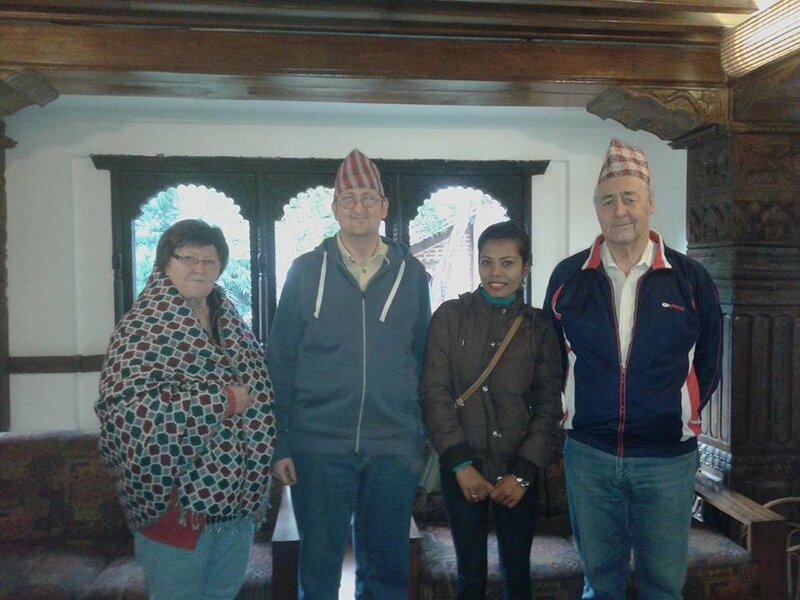 Jamuna took us to her house where she had invited us for a cup of coffee. We met her father, but he unfortunately spoke very little English. 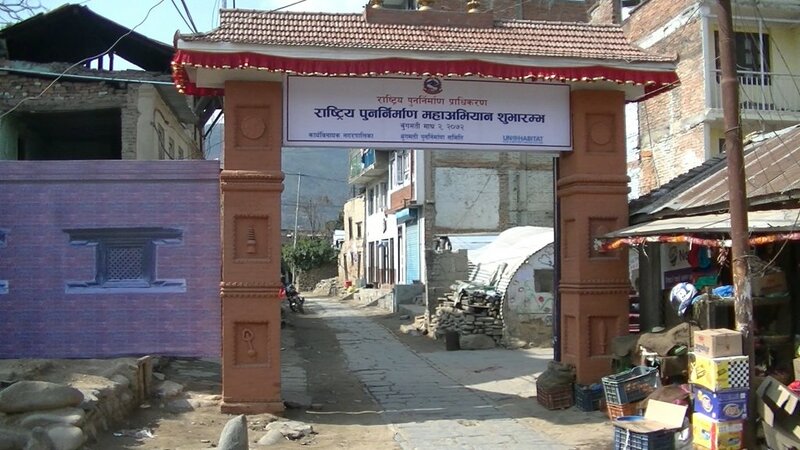 Then we took a walk through the village, and also to the Rato Machhendranath Temple, or to the place where it was located till the earthquake of the 25th April 2015. 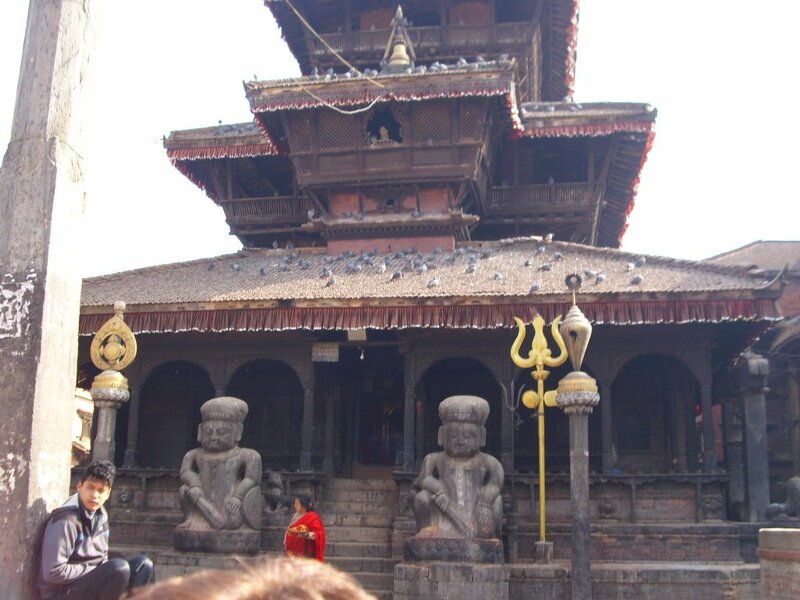 The temple was built in 1593 in Shikhara style and completely destroyed by the earthquake. 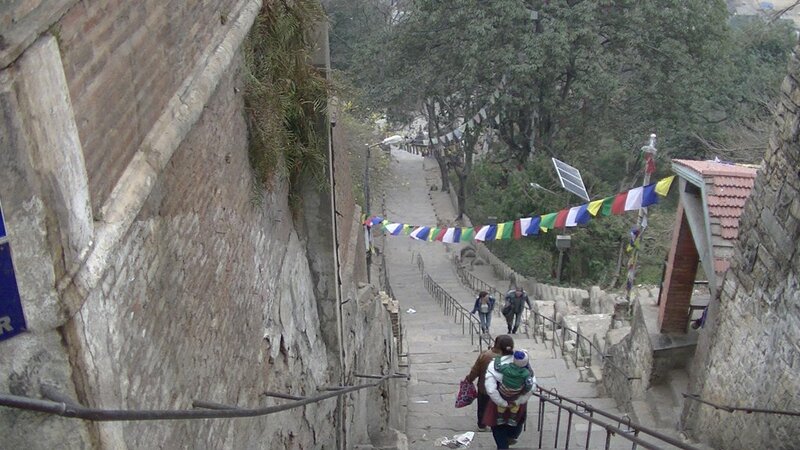 After our walk we continued to Khokana. 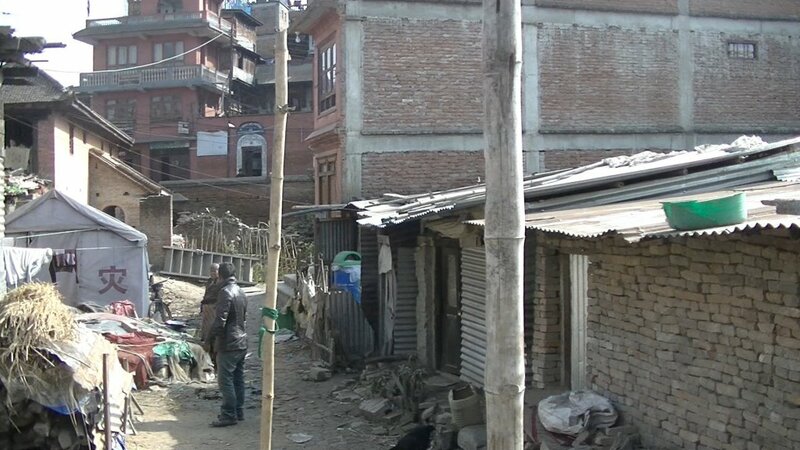 This village is situated about one kilometre from Bungamati. 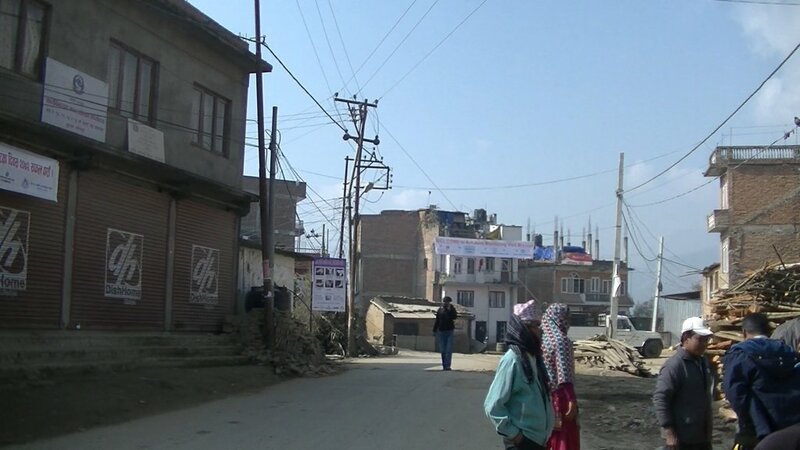 Earlier, Bungamati and Khokana were each independent municipalities, but are joined together since 2014 to create a bond with Chhampi, Dukuchhap and Sainbu. 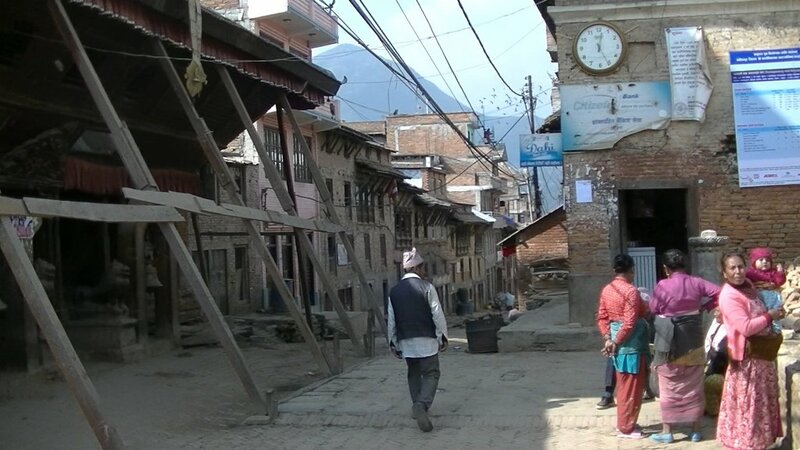 The city Karyabinayak based on it, was founded on 2th December 2014 and is home to about 38,000 inhabitants. 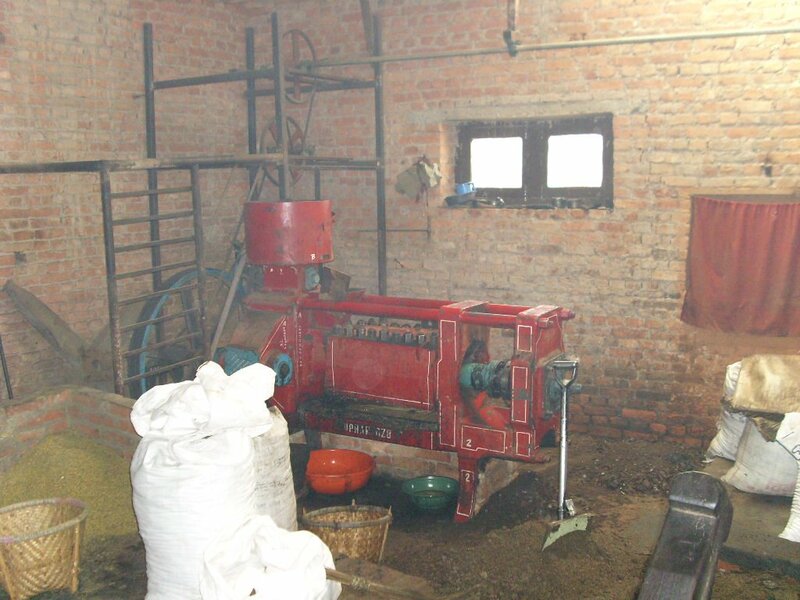 Khokana is famous for its mustard oil production. 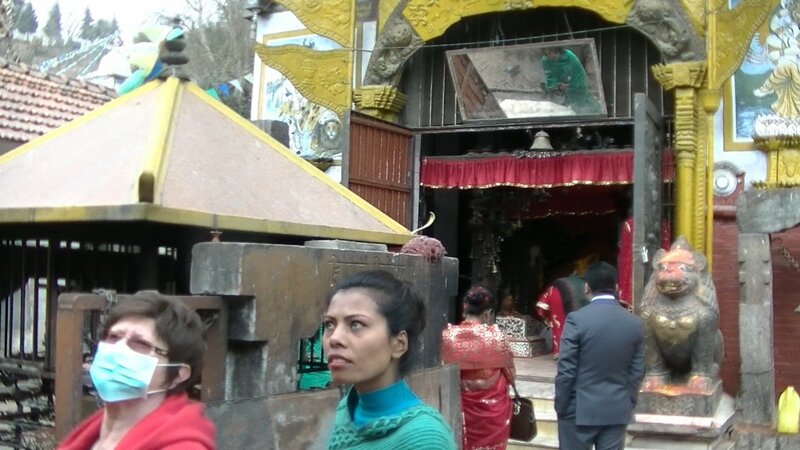 On the way to Kirtipur, we made a stopover at the Jal Binayak Temple. 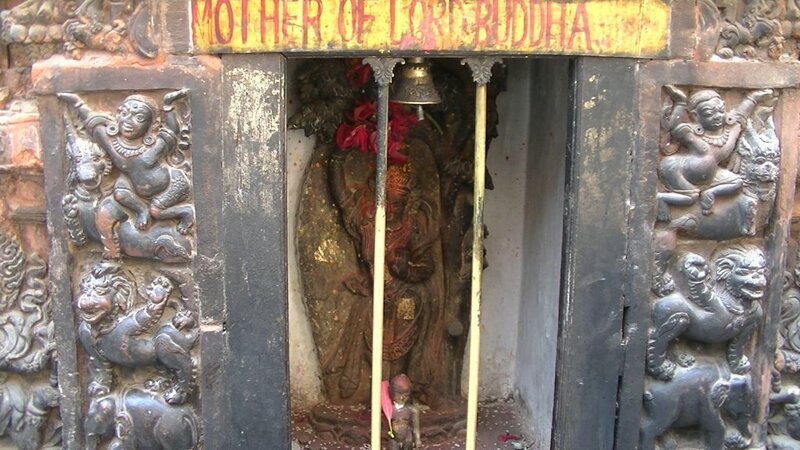 The temple is dedicated to the Hindu God Ganesh, built in 1602. 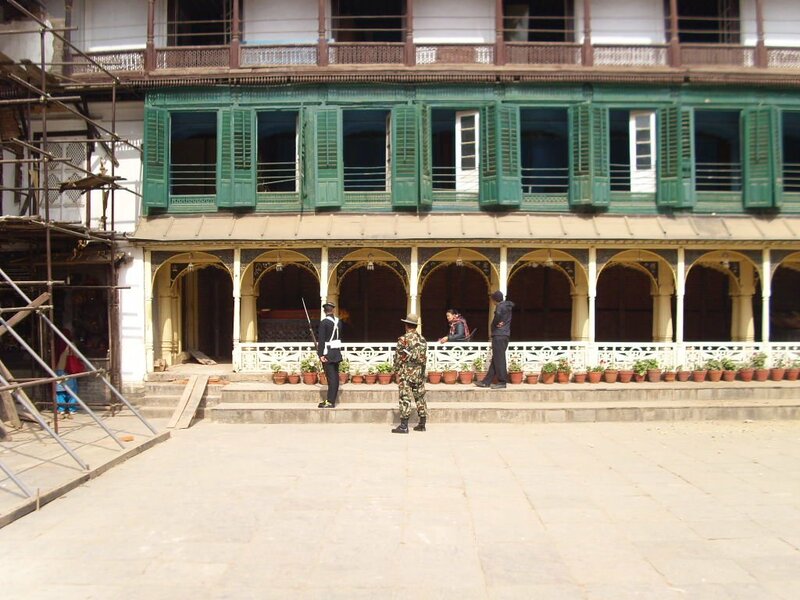 In 1750 it was renovated by King Rajya Prakash Malla of Kathmandu in pagoda-style. 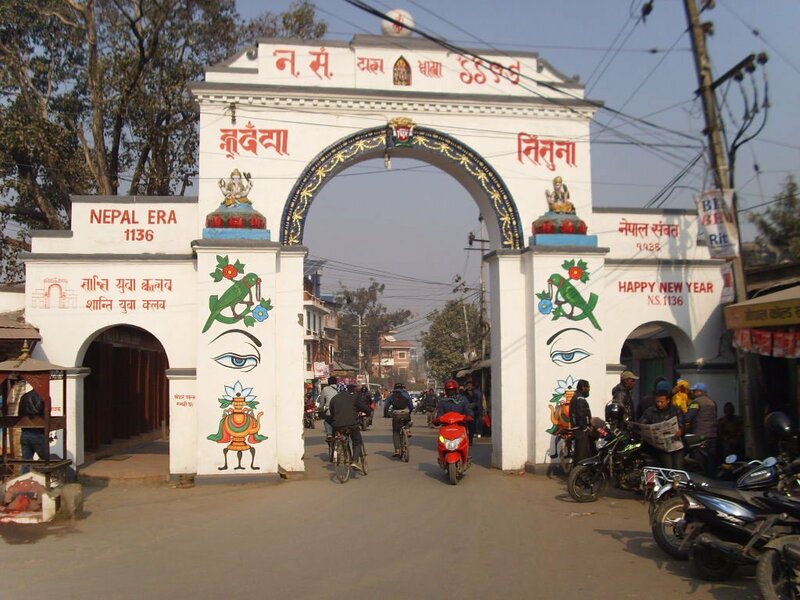 Kirtipur is located southwest of Kathmandu, on a small hill. 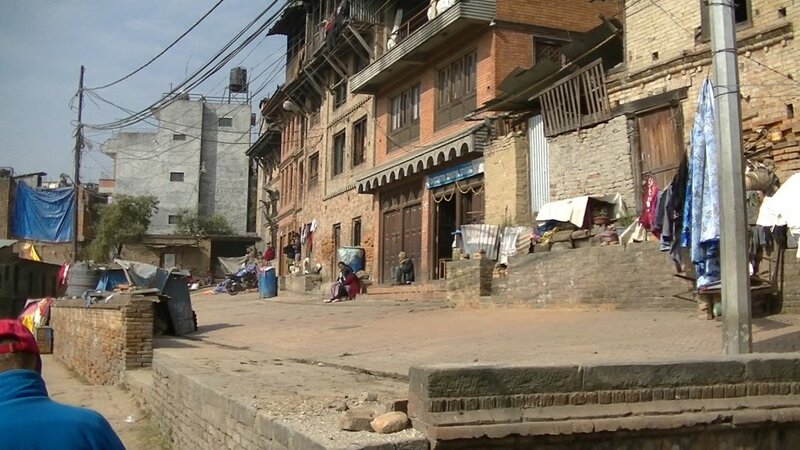 At the conquer of the Kathmandu Valley by the Gorkhaking Prithvi Narayan Shah in the year 1767, Kirtipur offered fierce resistance, and could only be taken at the third attempt by a trick. In revenge for the resistance, the Gorkhaking let cut off noses and lips of all the inhabitants. 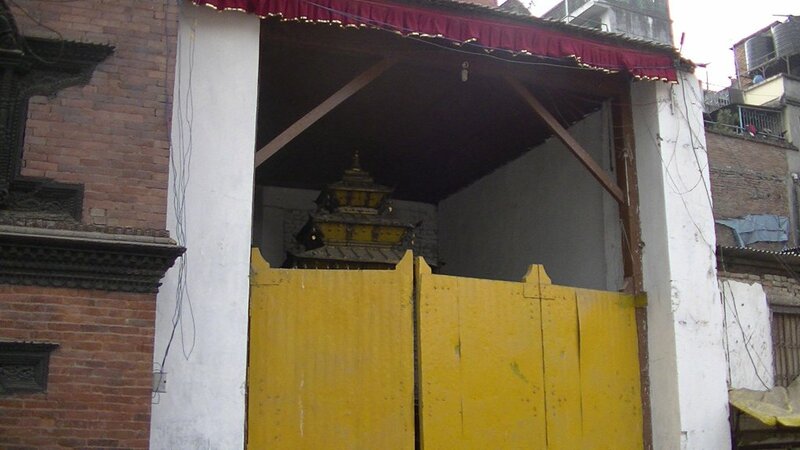 On our walk through Kirtipur Jamuna showed us the Bagh Bhairab Temple, which was probably built in the 16th century. 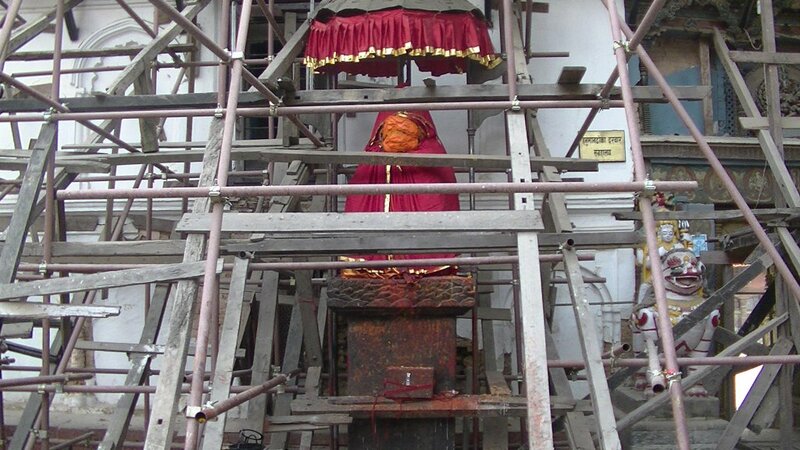 It is dedicated to the God Bhairab in form of a Tiger. 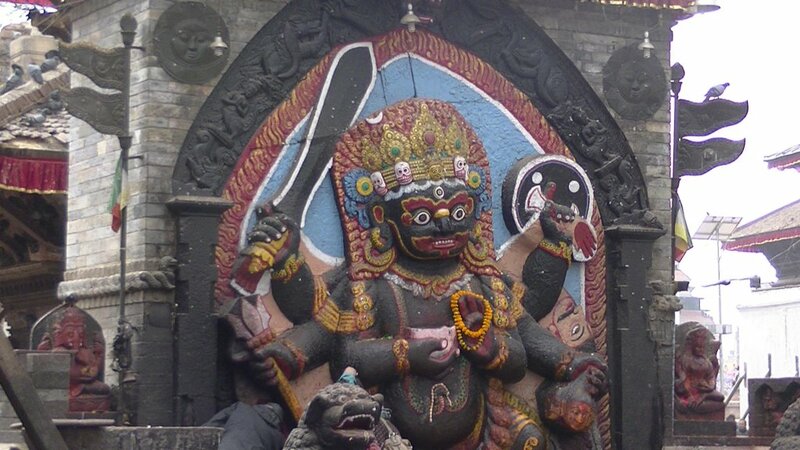 He is seen as the protector of Kirtipur and called Ajudeu by locals. Because Jamuna had to work even today, we drove back to Bungamati to bring her to her company. 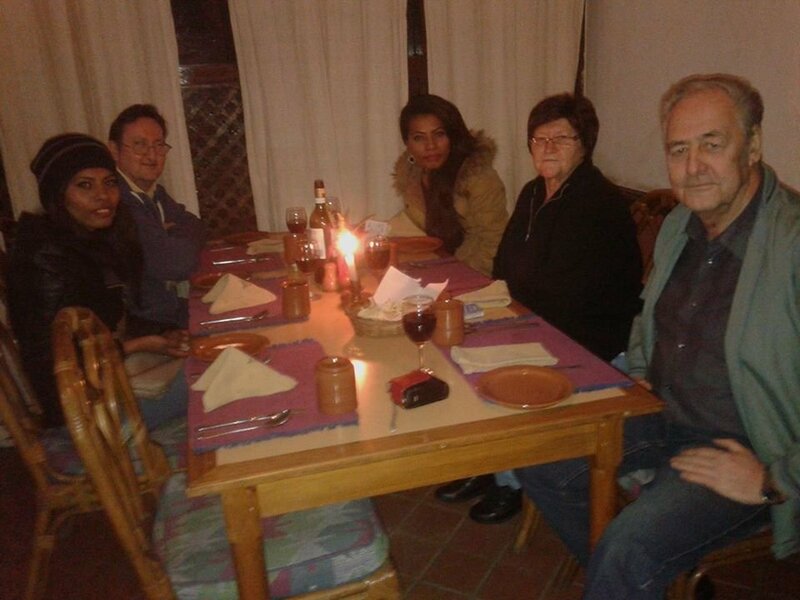 Jamuna promised that she wants to come in our hotel again tomorrow, before we fly back to Germany on Friday. We said goodbye and drove back to our hotel. The following day we went to breakfast a little later and then took a last walk around Thamel. After packing we took a rest before the long journey. In vain I waited for Jamuna or a message of her. Shortly after 21:00, Ganga sent a message and promised that she would come tomorrow with Jamuna for breakfast and to say goodbye. 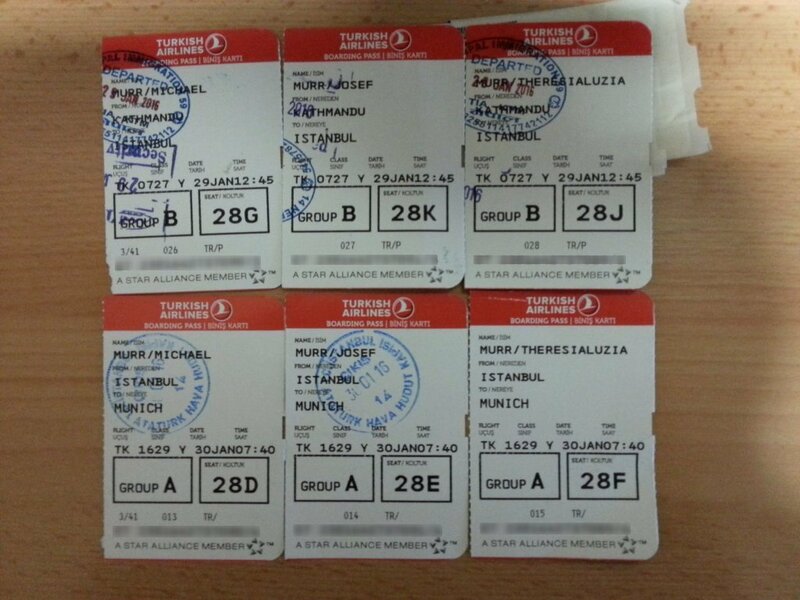 On Friday we returned to Germany via Istanbul. 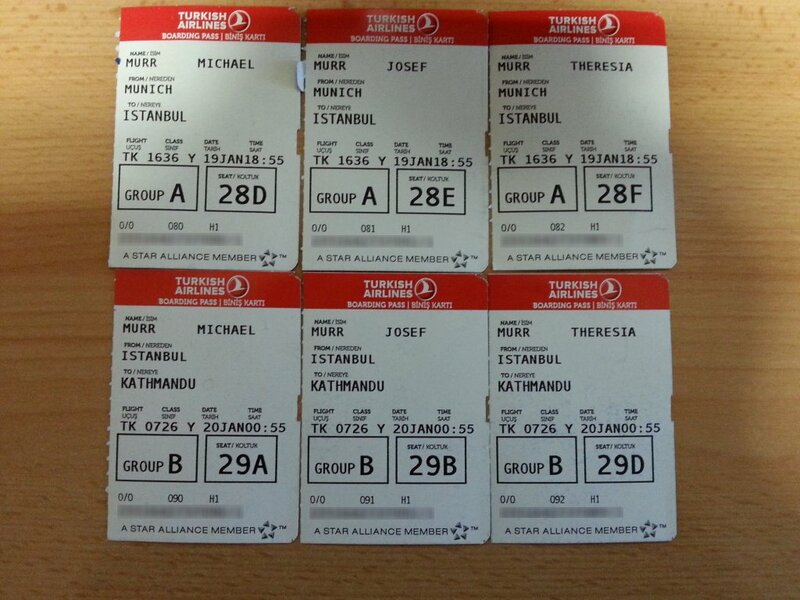 Due to the fuel shortage in Nepal, a journey of more than 30 hours is upcoming for us. We had scheduled breakfast for 7:45 and departure to the airport for 9:30. Already at 7:30, Jamuna and Ganga were in the lobby and waiting for us. For my father and me they brought a Dhaka Topi, a Nepalese headgear, for each and a kind of poncho for my mother as a farewell present. Before we went for breakfast together, we took farewell photos in the lobby. 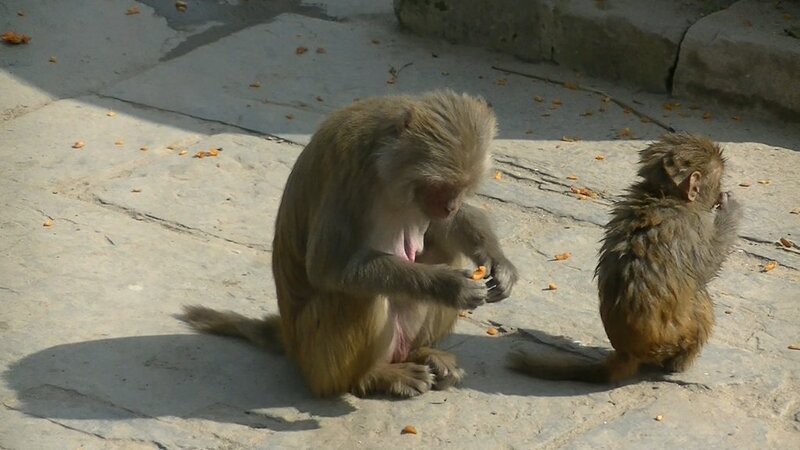 Again Jamuna was in stress to work and left us while Ganga stayed until end of breakfast. We said goodbyes and I promised to come back. At 9:30, we were picked up and brought to the airport. Check-in was no problem and we had the first security checkpoint quickly behind us. We came into a room, where we had to fill out the embarkation cards. Now we went to the actual departure and passport check. Immediately afterwards a further security check, with the obligatory check of the hand luggage. As already at the immigration, no one was interested in my computer and photo stuff even when leaving the country. 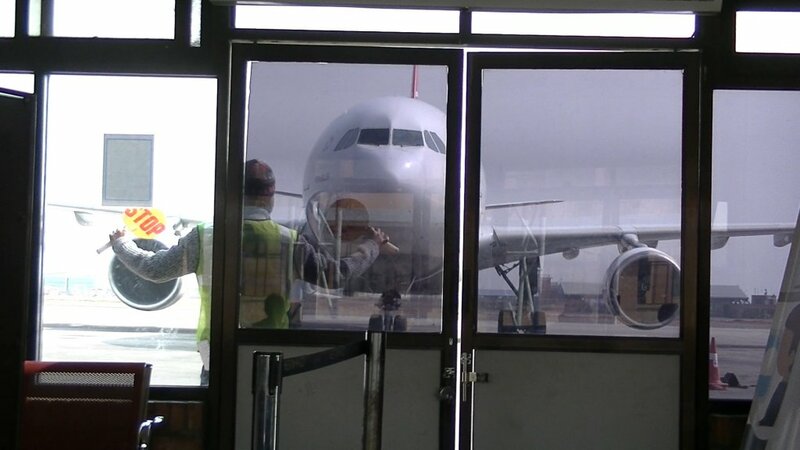 After this last check, we continued to the gate 5, from where we should start the flight. Again waiting. The boarding started with a little delay. One last look at the tower and the airport building and we taxied to the runway. 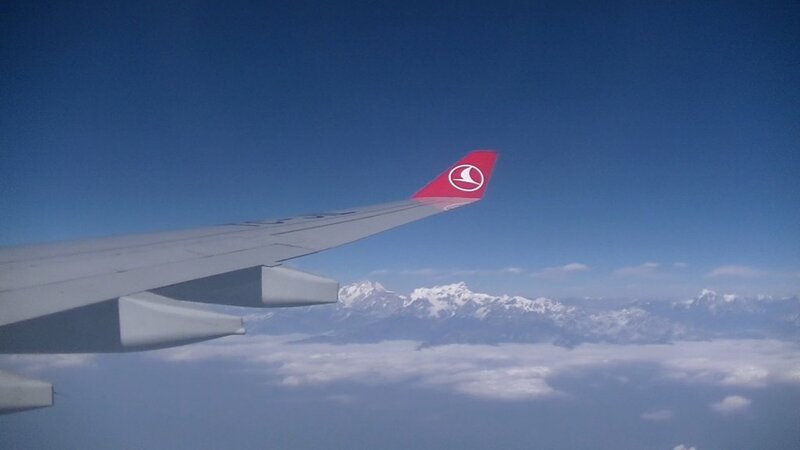 A few minutes later we were on the way to Istanbul. 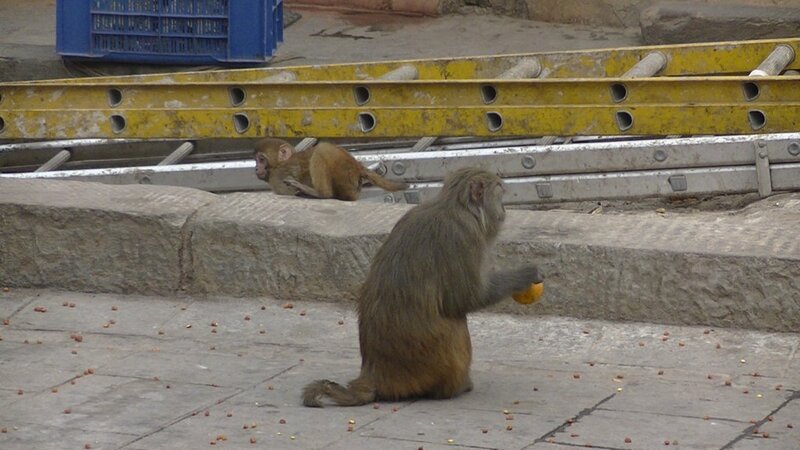 Previously, we had to refuel in New Delhi. Over 10 hours to Istanbul. - Plenty of time to think. - Will we return again? - Can we meet again with Jamuna and Ganga? - What are my parents thinking? 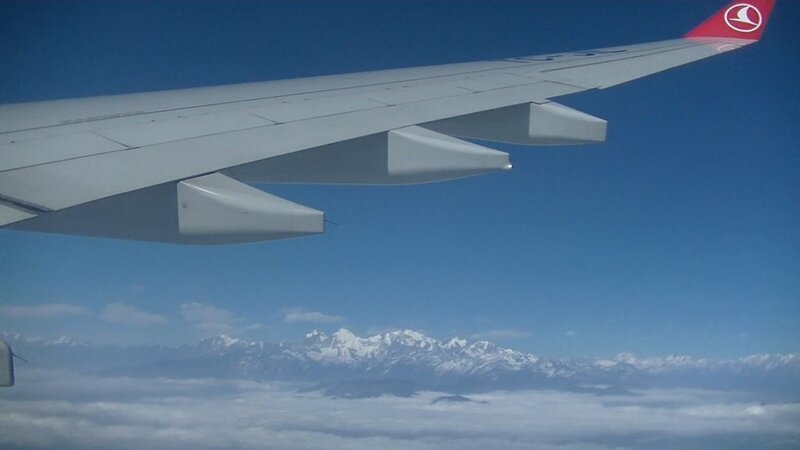 - On the return flight, we have free view on the 8000 m peak of the Himalayas, which was denied for us at arrival. For me it's clear, I have to come back. 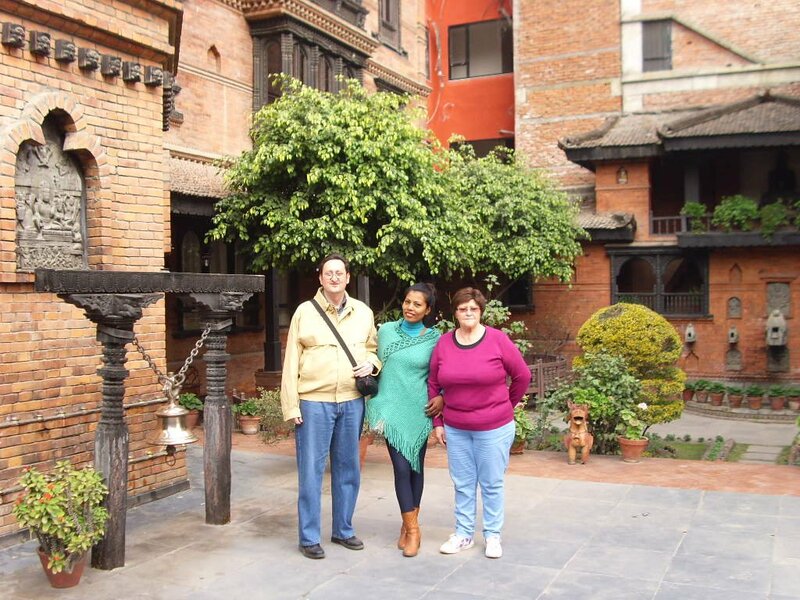 I promised Jamuna and her sister and it was one of the best trips ever.